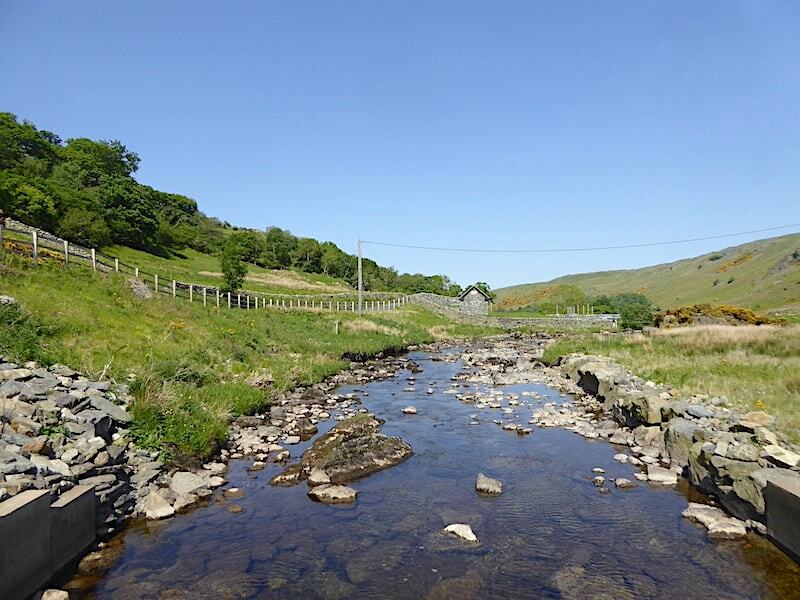 The wonderful weather is still with us and with it the opportunity to be out walking once again. 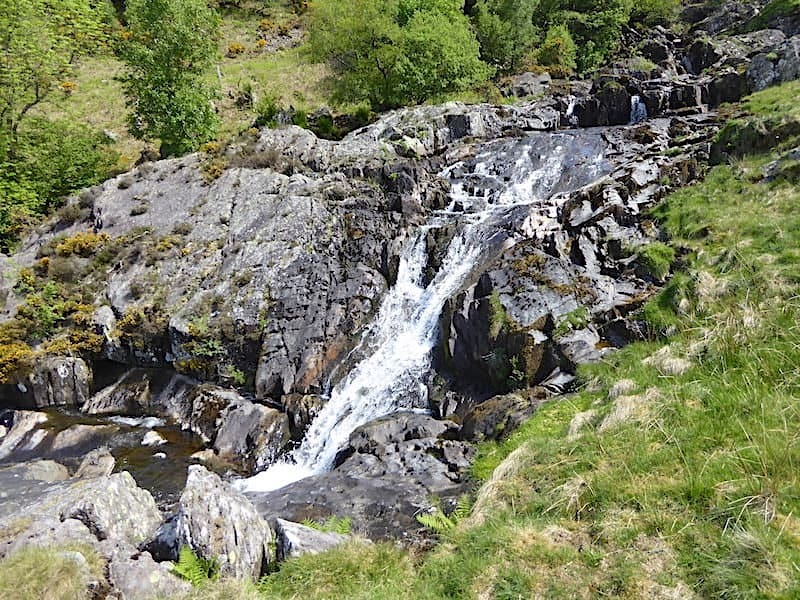 Today we’re just having a leisurely walk, very close to home, along the quiet valley of Swindale followed by a short climb up beside Mosedale Beck to view Forces Falls. 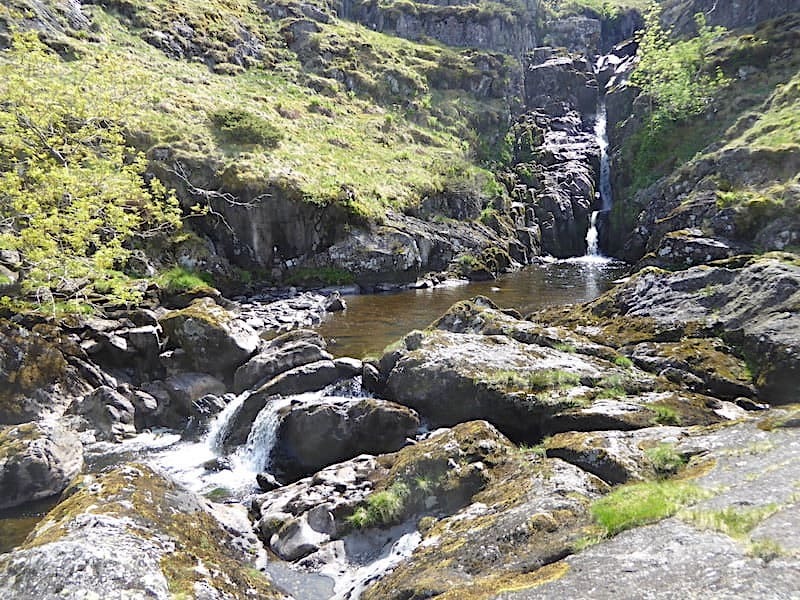 The sun was very bright today so some of the walk photographs suffered extremes of deep shade and bouncing light. 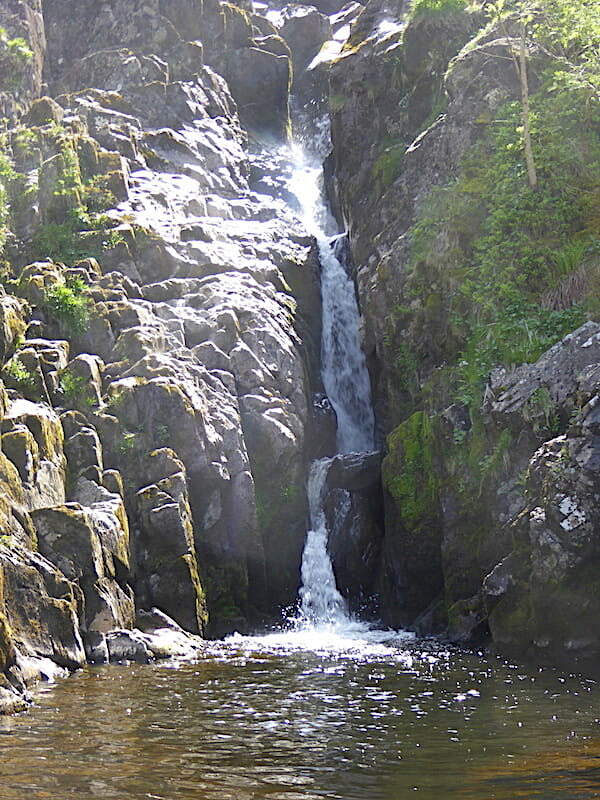 As the whole point of the walk was to visit the falls there are quite a few shots of them, so you might want to look away now if waterfalls are not your thing. 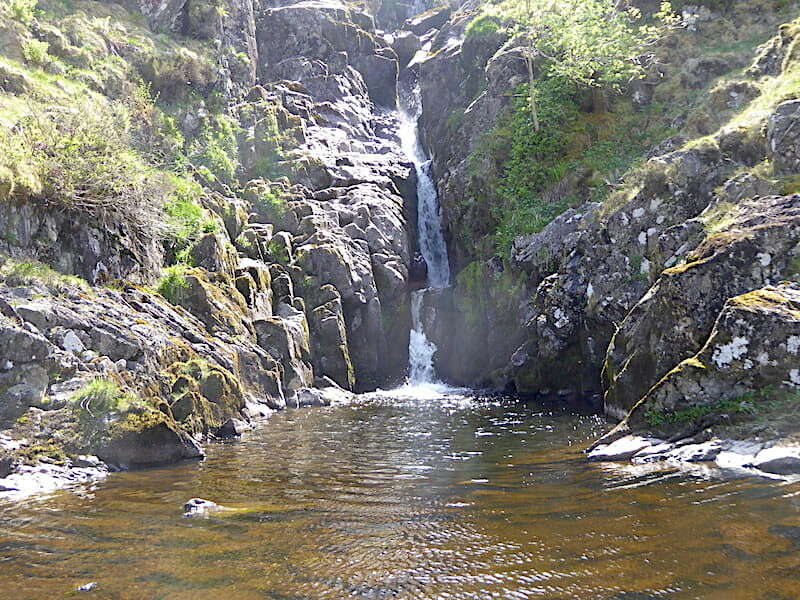 The falls are lovely and the fabulous weather showed them at their best today, a really lovely walk which was absolutely perfect for a very hot day. Behind me is the parking area in Swindale where half a dozen cars were already parked when we arrived about half past ten, we didn’t have an early start as its only a short drive from home. 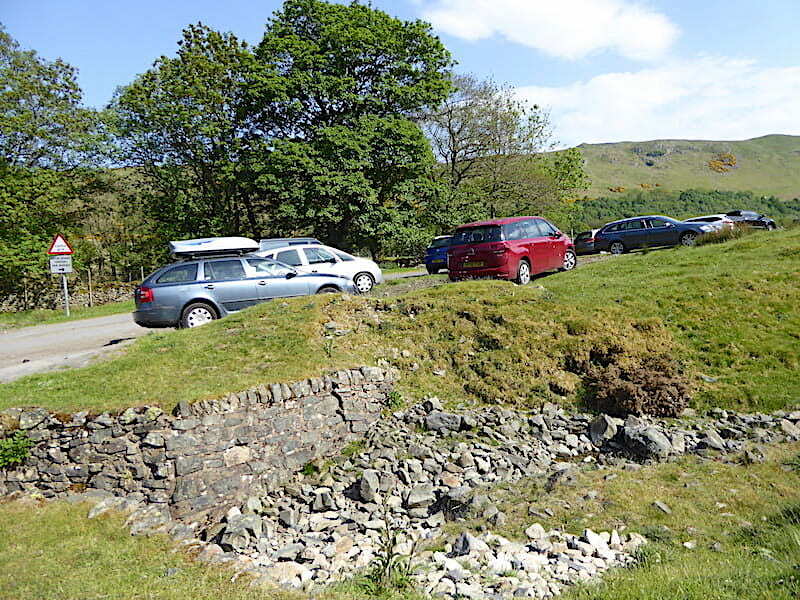 On previous visits to Swindale we have never seen more than two or three cars parked here no matter what time we arrived so we were a little surprised by the number of cars already here. The occupants of the one we parked next to were two young chaps chatting away non-stop as they hauled what looked like miles of climbing rope, and assorted climbing tackle, out of the boot, all of it looking heavy and unwieldy. I was thankful to be carrying only my camera and not be lumbered with all the gear they had to lug down Swindale Lane. 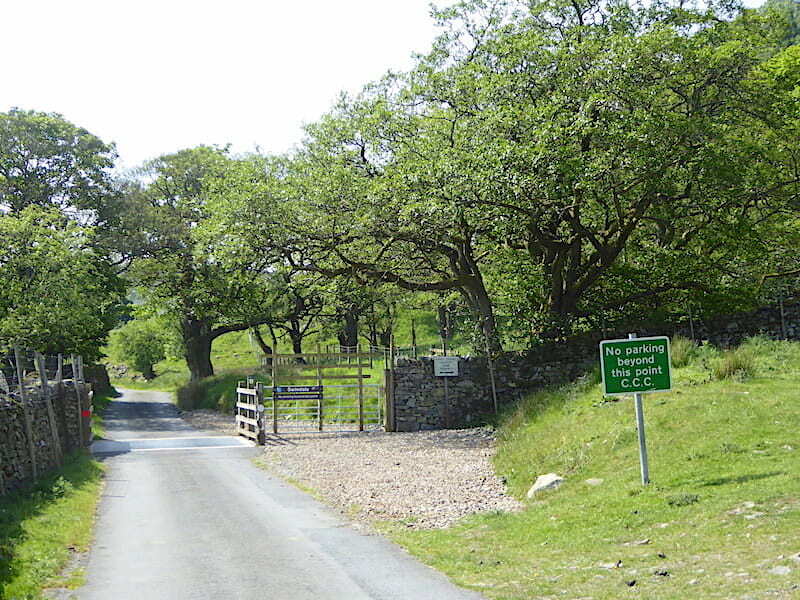 Beyond the Cumbria County Council sign the road is closed to unauthorised traffic so from this point there is a walk of 1.7 miles to Swindale Head Farm. 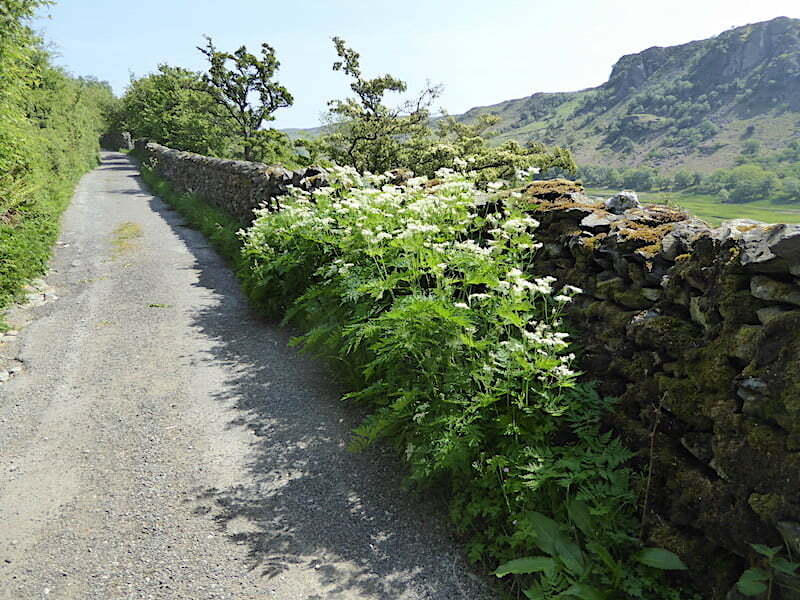 Road walking is not our favourite pastime but the absence of traffic makes it more tolerable and gives walkers the space to enjoy whatever sights turn up along the way. These two, for example, who were quietly enjoying the shade of a large tree while giving us the once over as we passed by them. 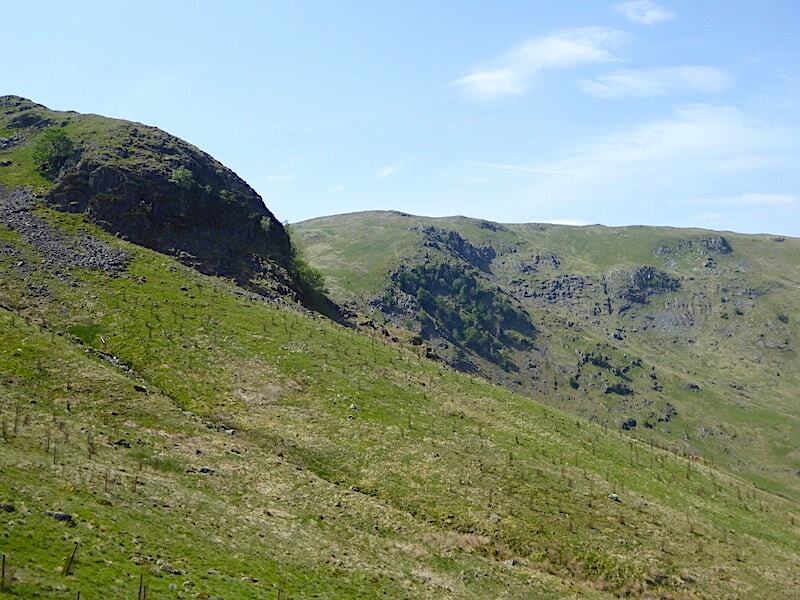 A little further along from the parking area we reach Swindale Foot Farm beyond which, on the left skyline are Gouther Crag and Outlaw Crag, quite possibly where the two young lads are heading with all their climbing gear. They are some distance up ahead of us and charging along, we on the other hand are in no hurry whatsoever. 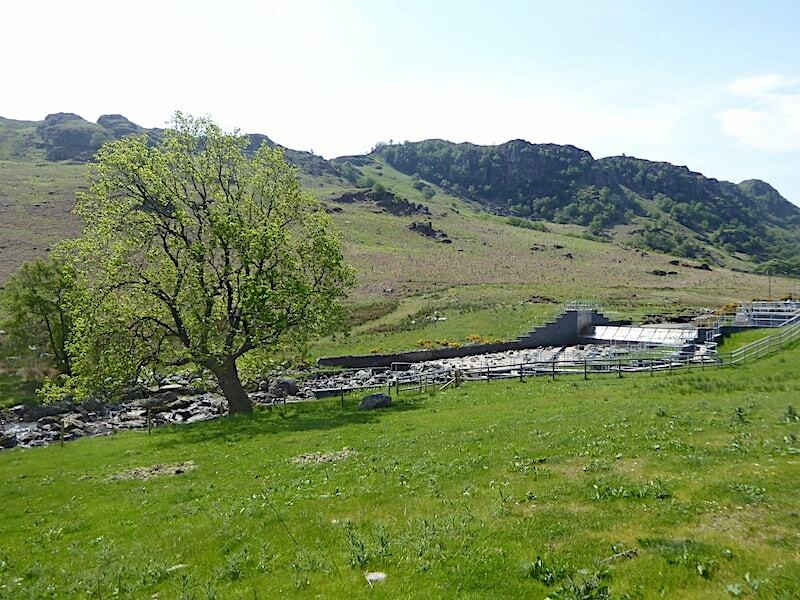 That’s not a waterfall we have come to see, its part of the water intake facility which was installed a year or so ago after Swindale Beck was re-meandered in 2016. 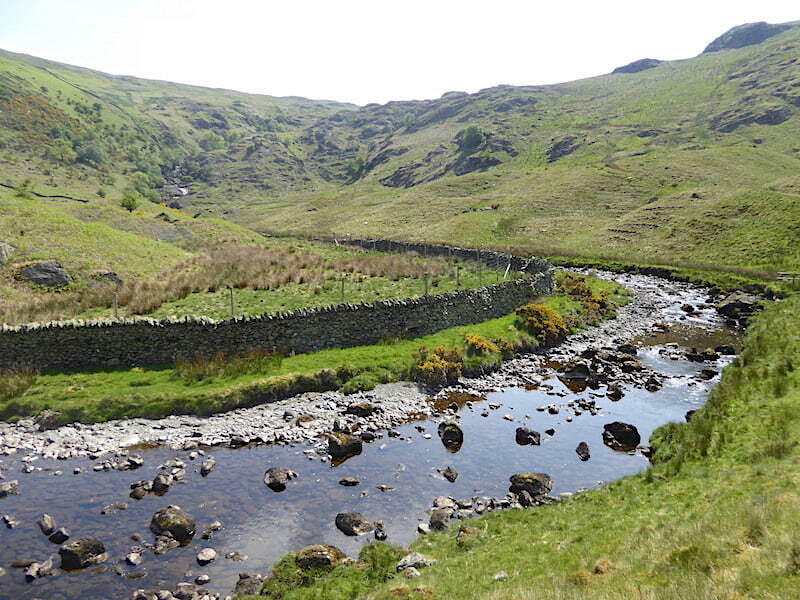 The intake facility may be necessary but it does not sit at all well in this lovely valley. Angular concrete blocking and access ways, hard metal fencing and support structures, and an ad-hoc arrangement of stone blocks on a flat bed of even more concrete have combined to produce a quite brutal monstrosity which sticks out like a sore thumb and completely despoils the landscape. Functional it may be, harmonious it is most definitely not. I couldn’t walk past it quickly enough. 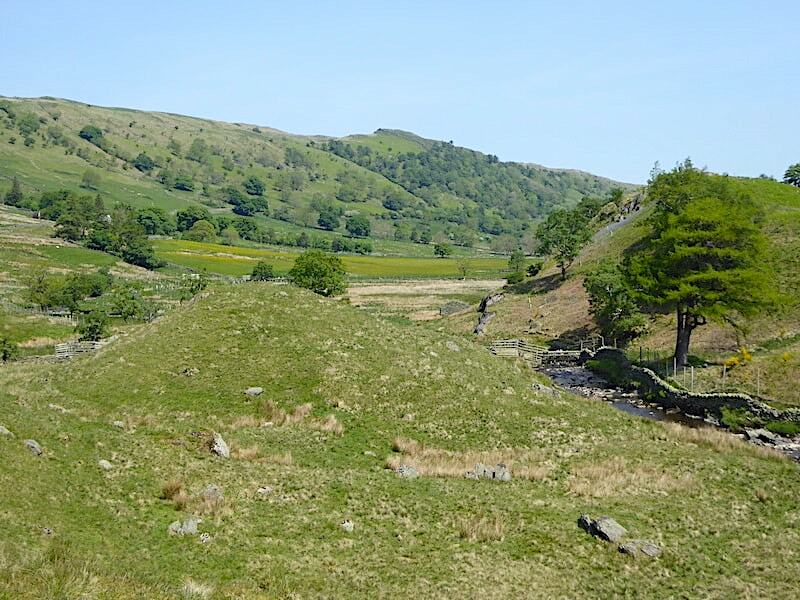 Just beyond the monstrous concrete and steel eyesore are the old stepping stones across Swindale Beck while up ahead is Truss Gap House. It will require a zoom in but to the centre left of the shot is a gate in the wall. Directly above that is another wall above which can be seen to two young lads I mentioned at the beginning. They are making their way over to Gouther Crag on the path we will be returning on. They were still climbing the crag when we passed below them four hours later. The hay meadows are just beginning to come into flower, the buttercups are gilding the grass with their glossy golden heads with white clover flowers sprinkled amongst them. Its still a little early for a full display but there might be more colourful display a couple of weeks from now. 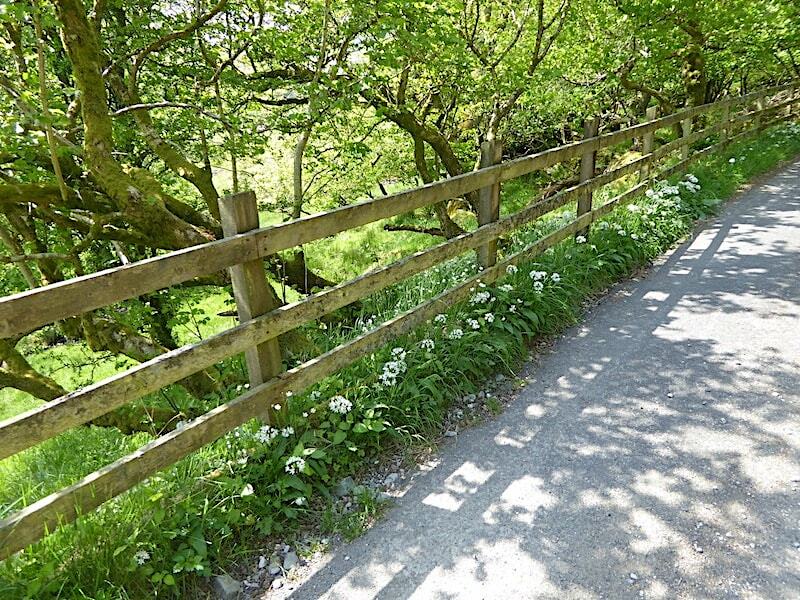 The absence of traffic makes for a peaceful stroll along Swindale Lane and the time to appreciate the beauty of the many wild flowers filling the verges on either side, wild garlic in abundance growing happily beside this mossy fence …..
….. very pretty flower heads on the wild garlic, made me think of the point at which a firework explodes and throws hundreds of tiny stars into the night sky. 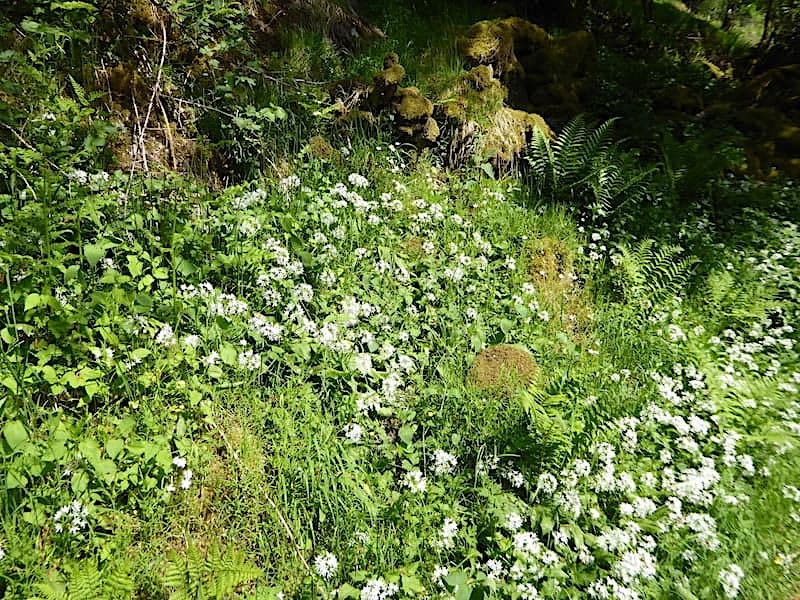 Clusters of wild garlic clambering up the steep banks of the roadside too. I thought about collecting some of the leaves to use as flavouring but decided that they would last longer if I picked some on the way back. Error. 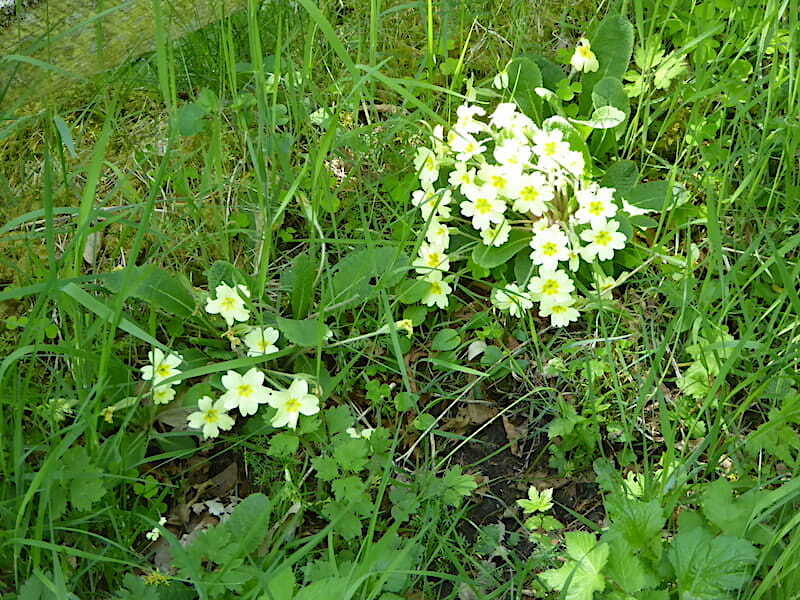 Wild primroses in abundance too …..
….. and clumps of sweet cicely here and there alongside the stone wall. 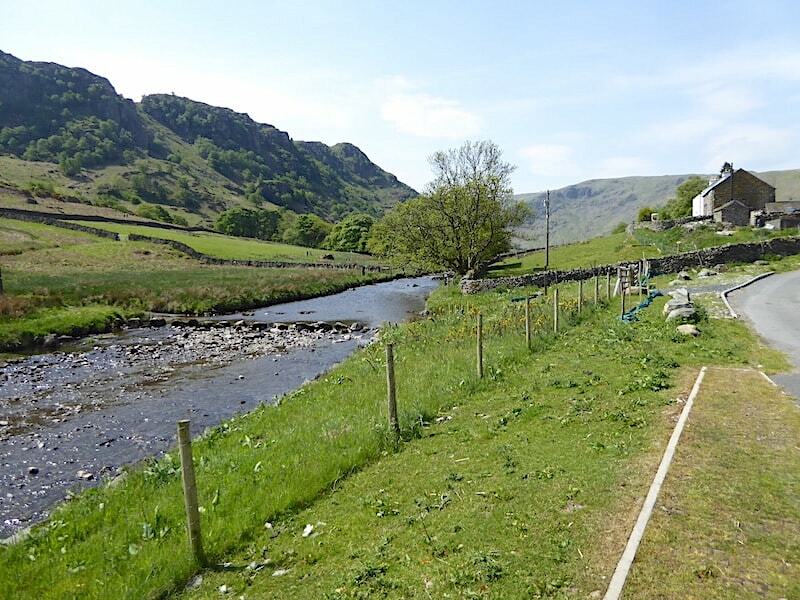 A look back along the quiet lane, now that the ‘water feature’ is well out of sight, with Gouther Crag and Outlaw Crag over on the right. We wondered how the two climbers were getting on. 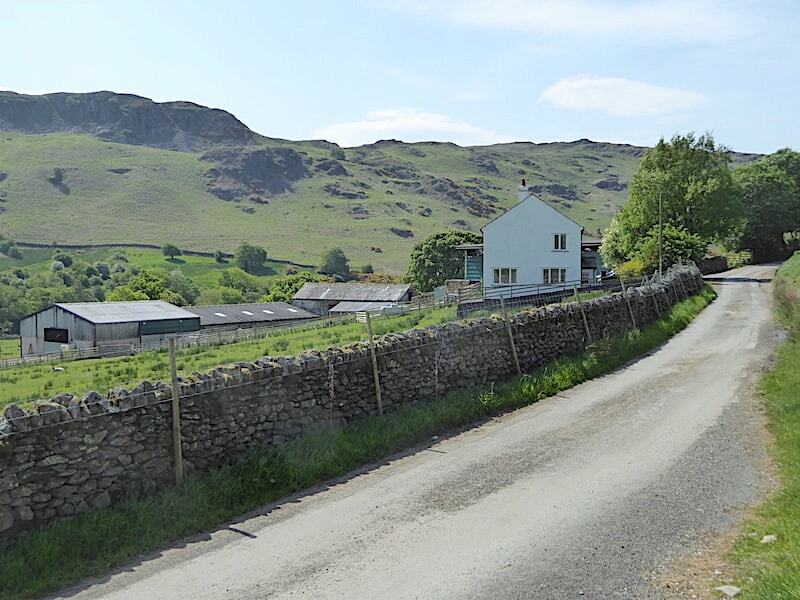 Looking into the head of Swindale as we approach Swindale Head Farm where the tarmac lane comes to an end. It was deathly quiet at the farm, no people, no activity, nothing. In fact there was so much nothingness that it felt almost spooky even on such a bright sunny day. Imagine what it must feel like on a dull and misty one. 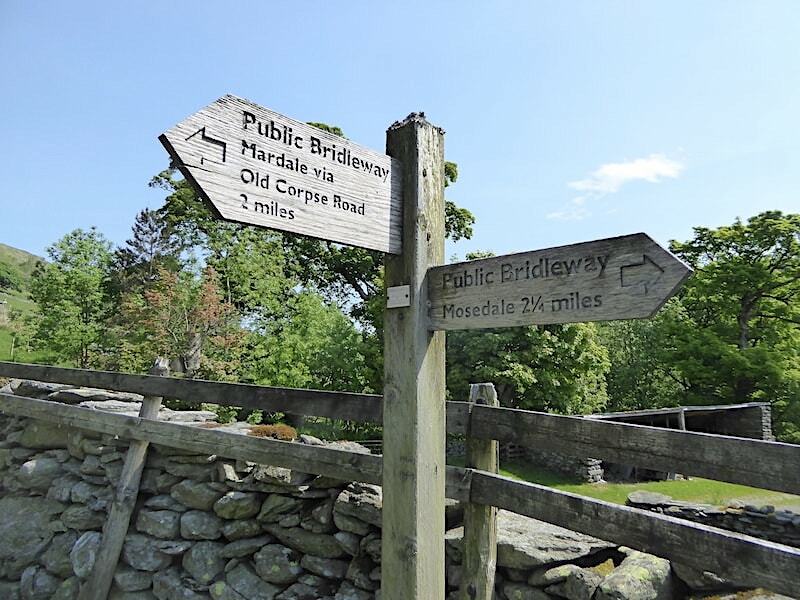 The signpost indicates a choice of routes at this point …..
….. up the hill to follow the Old Corpse Road to Mardale, from which you can branch off and walk over to Selside Pike and Branstree. 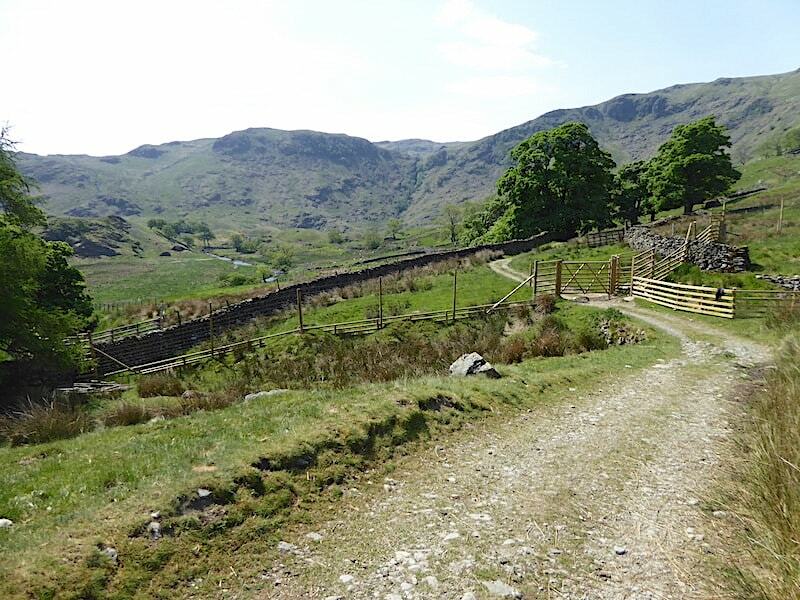 We take the Mosedale path around the farm buildings along the stony farm track …..
….. which leads us on into Swindale Head and across which several new deer gates have been installed. 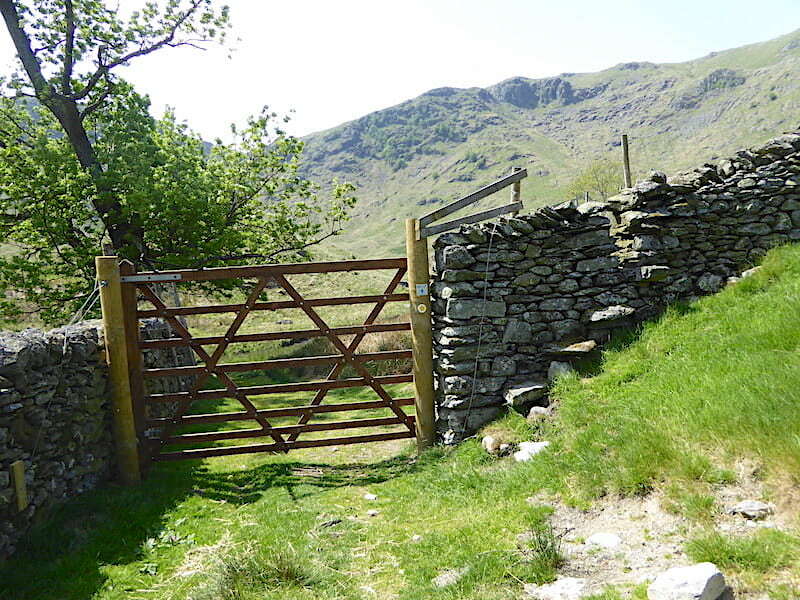 If there is a farmer around here it must be a right old pain in the neck to have to keep stopping to open and close the gates. Here’s another one of them, with a step stile alongside it. 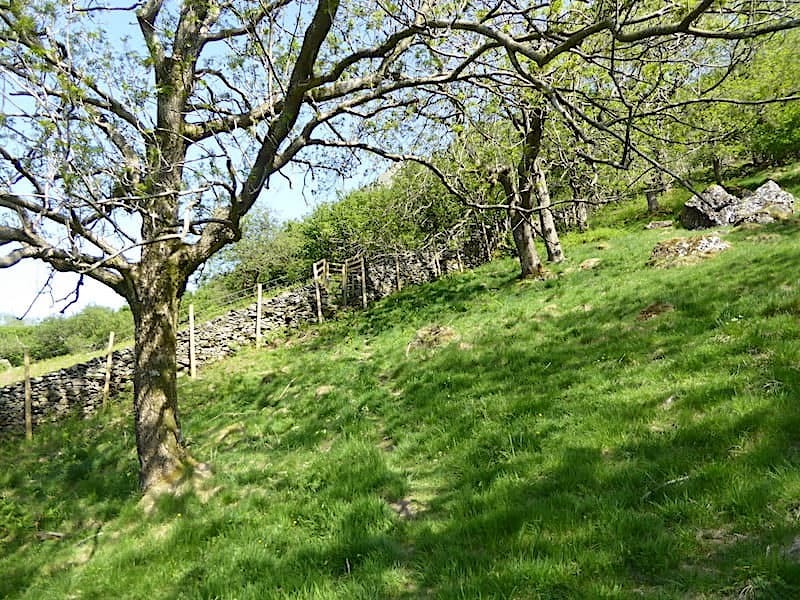 We would have used the stile but for some reason a wire fence has been strung across the top of the wall thus preventing anyone passing through it. I suppose we could have bent the bottom of the wire and created a gap to squeeze through but we didn’t want to damage anything so we used the gate instead. This sort of thing is annoying though, yes, you keep the deer out but also everyone else along with it. Yes, they have provided a gate but there’s no fun in that, especially if you are a family group walking along here with a few youngsters. Children, and plenty of adults, would enjoy the experience of clambering over it, its fun, its unusual, its natural and it creates a memory that simply walking through a gate will never achieve. But no, instead we have to do as proscribed by others, others who don’t seem to have the ability, the imagination or the will to find a creative solution to a fairly simple problem. They couldn’t even install the gate posts vertically or hang the gate on the horizontal either, sloppy, inconsiderate work in my opinion. 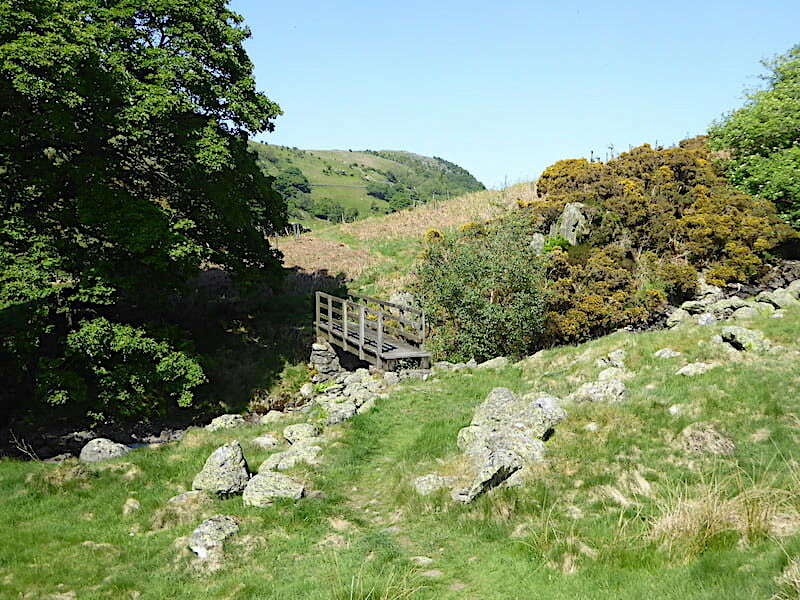 A little plank footbridge crossing the outflow from Dodd Bottom leads us through a series of drumlins and provides an entertaining couple of minutes as the path threads through and around these miniature dumpy mounds. 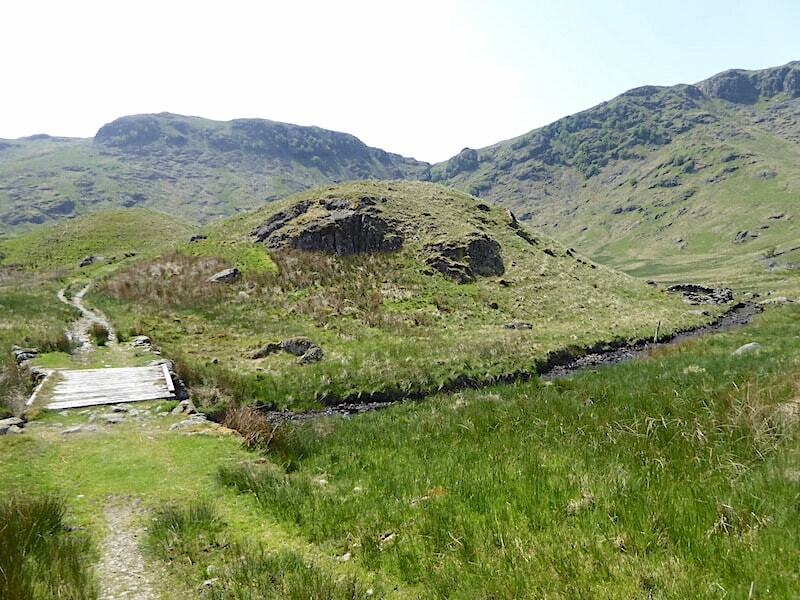 The track swings us round between Swindale Beck and this large marshy basin known as Dodd Bottom. 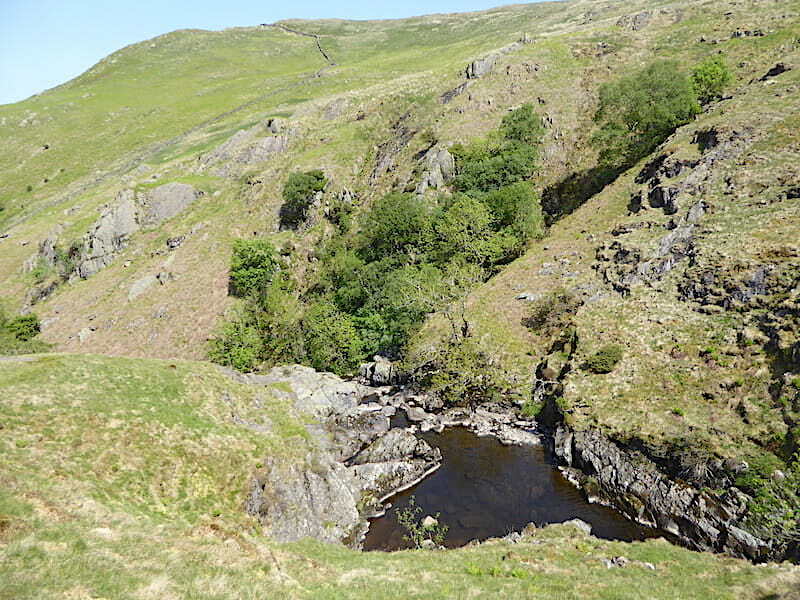 Surely there was once a large tarn filling this basin, that would have been quite a sight if there had been. 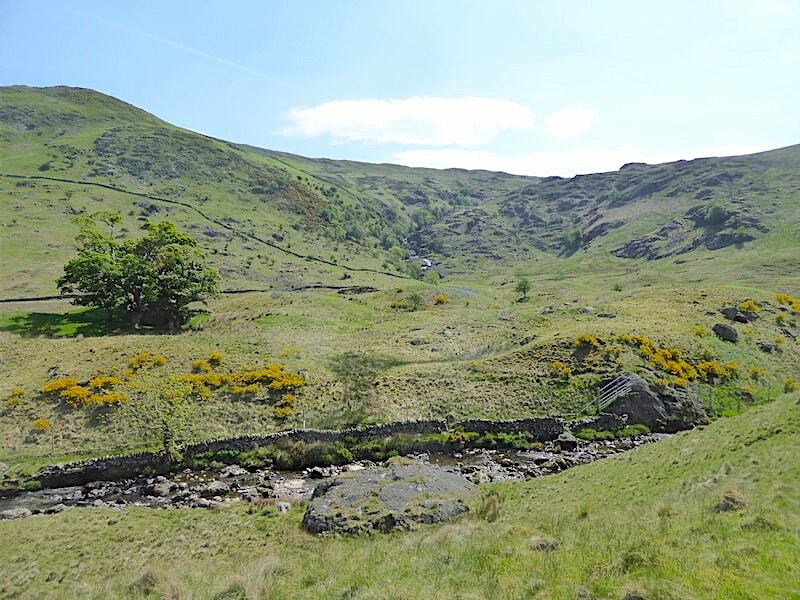 The deep cleft in the hillside is …..
….. the wonderfully named Hobgrumble Gill, a deep gorge cutting through the slopes and conjuring up visions of grumpy little hobgoblins hidden away up there, endlessly grouching about their lot in life. 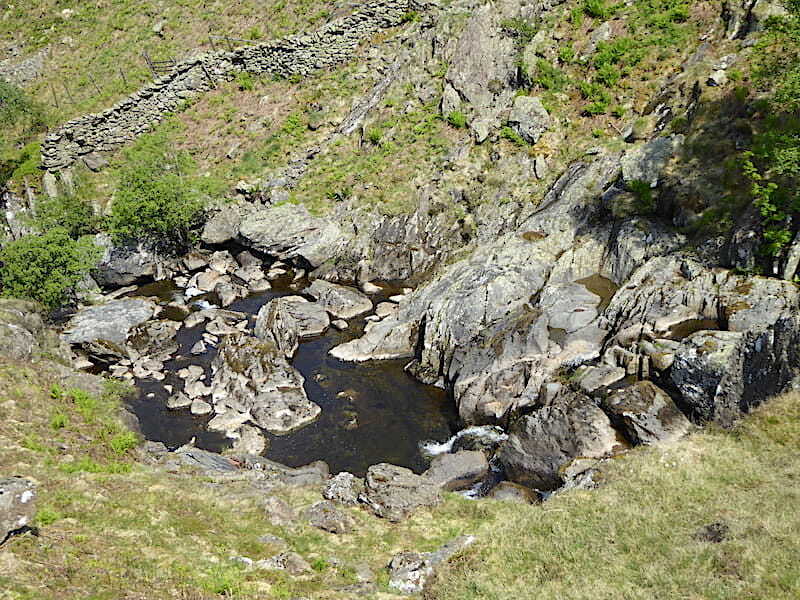 Directly opposite we see a silvery sparkle indicating that there is at least some water in Mosedale Beck. We had wondered if there would be because we haven’t had any significant rainfall for the past few weeks. Whether there will be enough for a decent display we’ll find out soon enough. Over on the left, within the trees is a feature, marked on the OS map but not on our route map, known as Simon Stone but it was difficult to see it clearly thanks to the foliage and deep shadows around it. Still winding our way through the drumlins I took a look back through Swindale with the top of Black Crag on the skyline. Apart from the two climbers we’ve seen no-one else so far and the peacefulness of the place is wonderful. The track curves abruptly at this point across the raised section on the right of the shot. 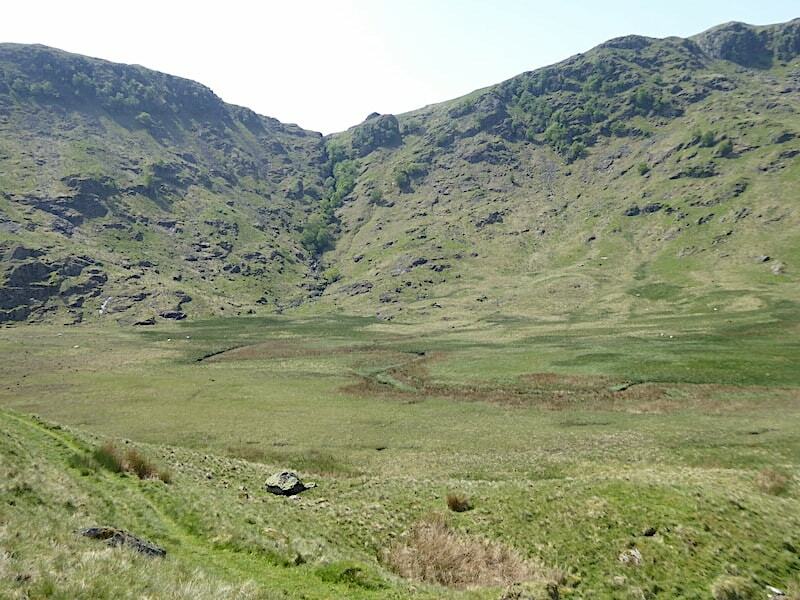 Its a stretch of glacial moraine, which runs between Swindale Beck below us, and Dodd Bottom which is out of shot to the right. 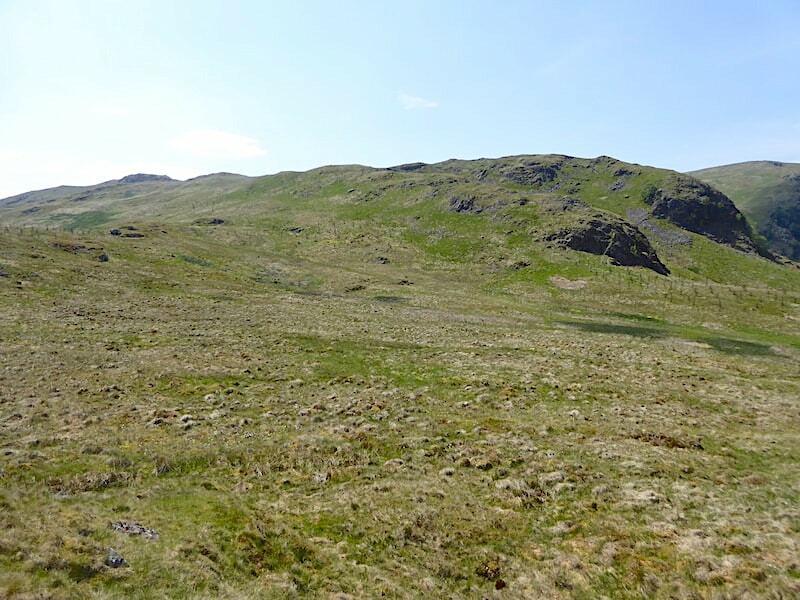 Without this short stretch of moraine, between one drumlin and the next, Swindale Beck would drain straight into Dodd Bottom. 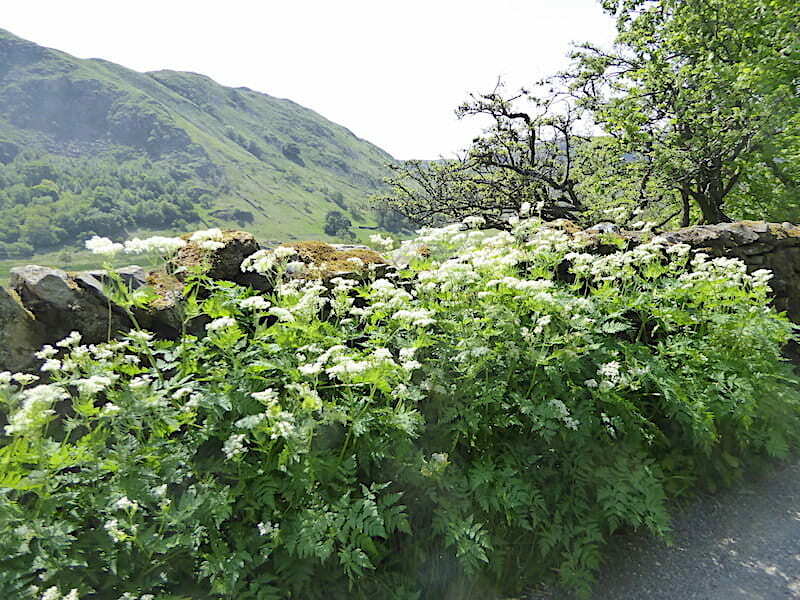 Eventually the track becomes a grassy path, an old bridleway, which rises through a series of hair-pin bends directly into Mosedale. 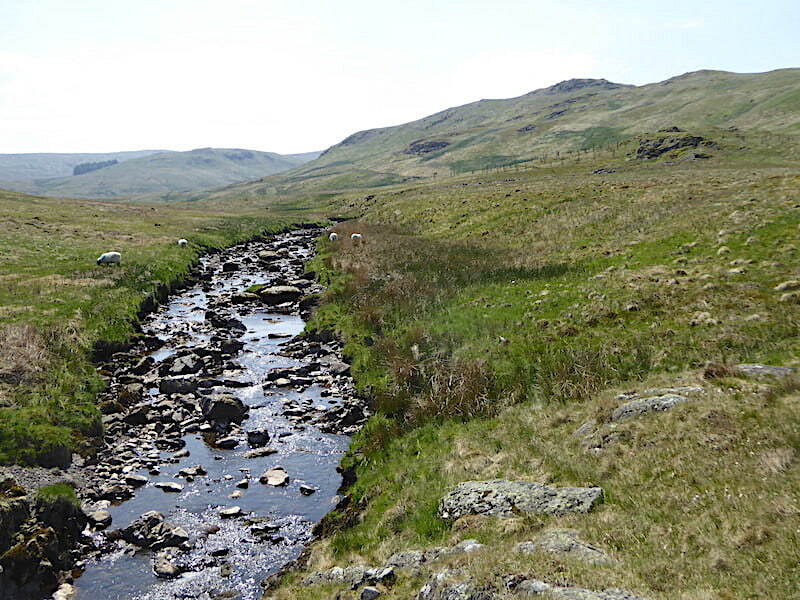 We leave the track before then and follow a faint track across a patch of marshy ground which leads us to the foot of Mosedale Beck. 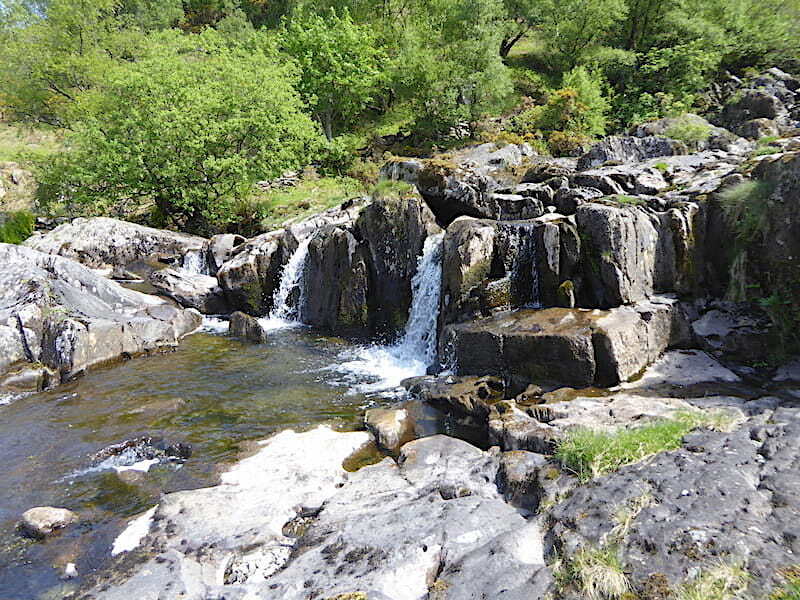 We arrive at the first pool and cascades, a lovely spot and where we lingered for a while. It was tempting to indulge in a spot of paddling but we resisted as there would be plenty of time for that later on. 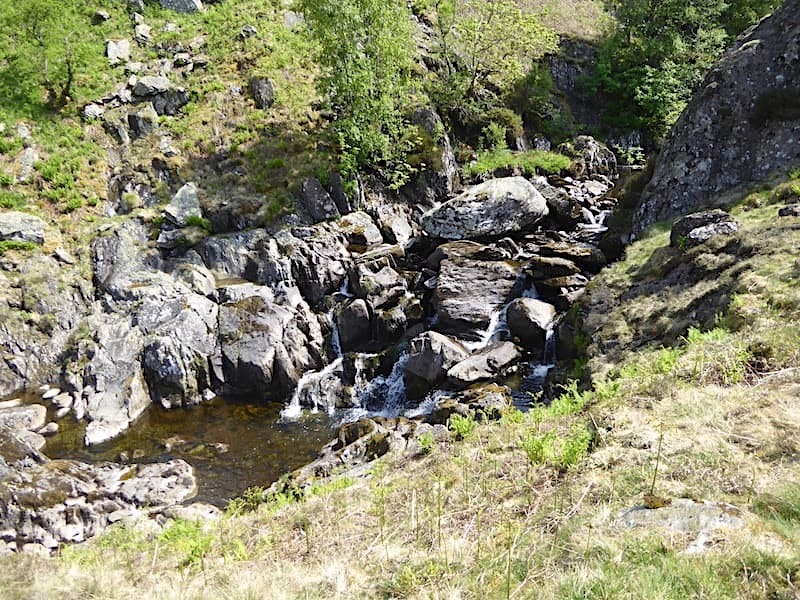 We don’t follow the beck along the ravine but climb up the rocky shoulder alongside it. 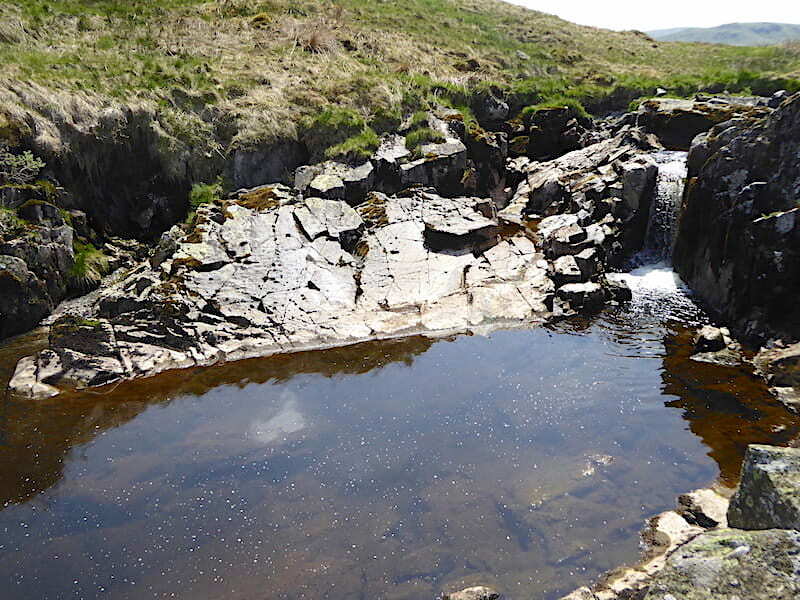 There a hint of a path but one isn’t really needed, keep to the right of the beck and carry on climbing until you reach the next vantage point where you will find …..
….. this rocky shelf and another set of cascades and pool. We also found another pair of walkers who, having spread their belongings over as much of the available ground as possible, looked as though they were in for the day. They also looked as if they were preparing to take a dip but our arrival seemed to put an end to that. We were viewed with an air of silent resentment which we completely ignored as we offered our hellos, receiving nothing by way of return. I know its annoying to have someone else interrupt you but it is to be expected in a public place and everyone else is as entitled to be here as they are. 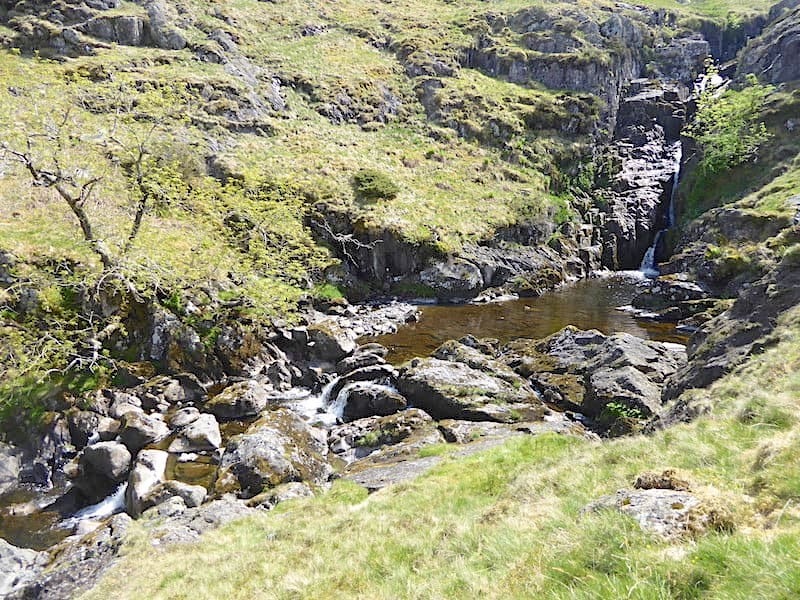 We carry on making our way up the grassy shoulder and reach the next set of falls which we have to view from above for obvious reasons but …..
….. by the twin falls just a little higher its possible to get a little closer. Higher still and I needed to sit down and shimmy along this very pointy rock to view the next set of falls. 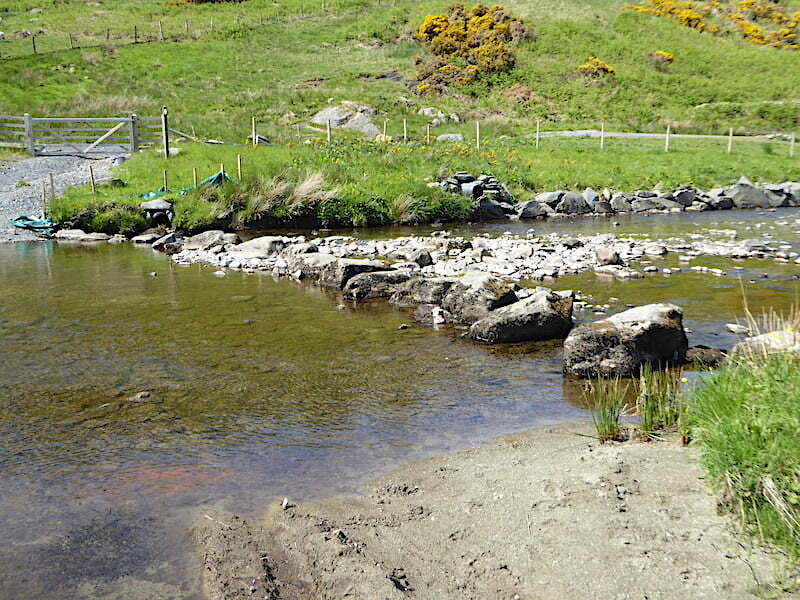 No, we didn’t even think about going down there, but we did admire the skill and tenacity of the dry stone waller who built that very long and sturdy wall rising up the opposite bank. The higher you go the more delights await you, boulder piled upon boulder, water pushing its way through every little crevice, quiet little pools, plants clinging like limpets to the steep sides of the gorge, its was just lovely to stop at every vantage point and enjoy the fascinating scene below. 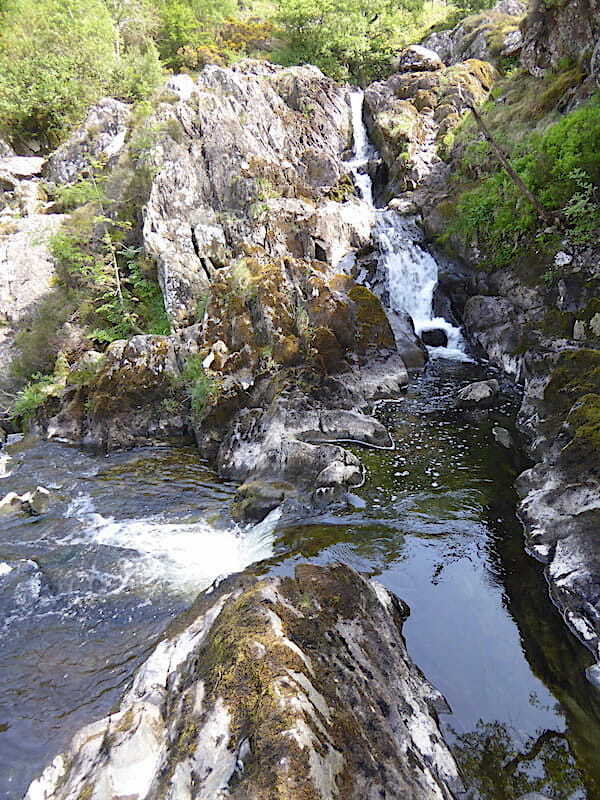 We didn’t venture down there either …..
….. but the view down to the pool from this flatter point above it was safe enough. Pools of water left in the rocks suggest a greater force of water must have been tumbling down at some point, although the dryness of the rocks suggests that it must have been quite a while ago. That wasn’t a place we ventured into either, very steep sides, rocks right to the water’s edge and the tree foliage creating some very dark looking places. 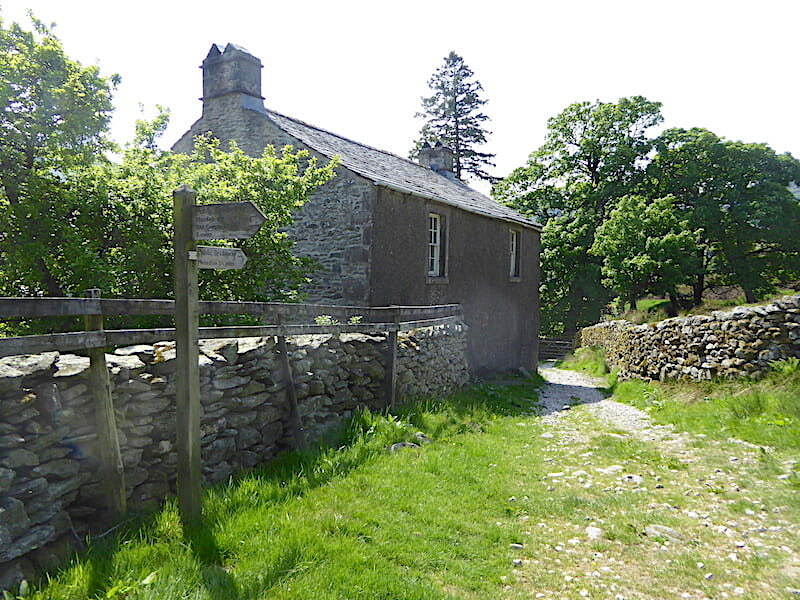 You never know, it could just be the sort of place where a grumbling hob might be lurking. This was, for us, the highlight of the walk up here. 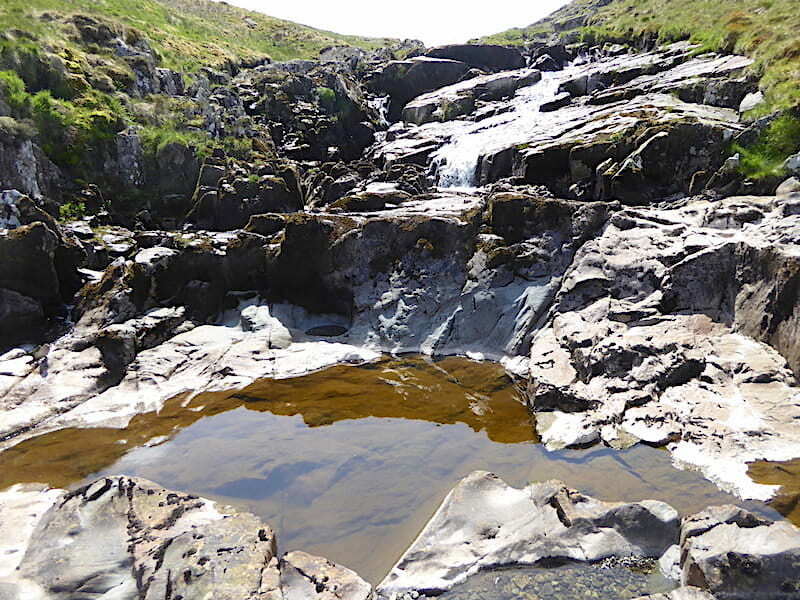 A stunning cataract of water dropping from quite a good height into this lovely rippling pool was too good a spot to simply pass by so we dropped down a few easy slopes and stopped for our picnic. We were here by ourselves for well over half an hour ,just sitting on the grass and absorbing the sights and the sounds. We weren’t lucky enough to see a dipper but felt sure that there must be some around as its just the kind of place they seem to like. One last look before we tear ourselves away and carry on up to the top. 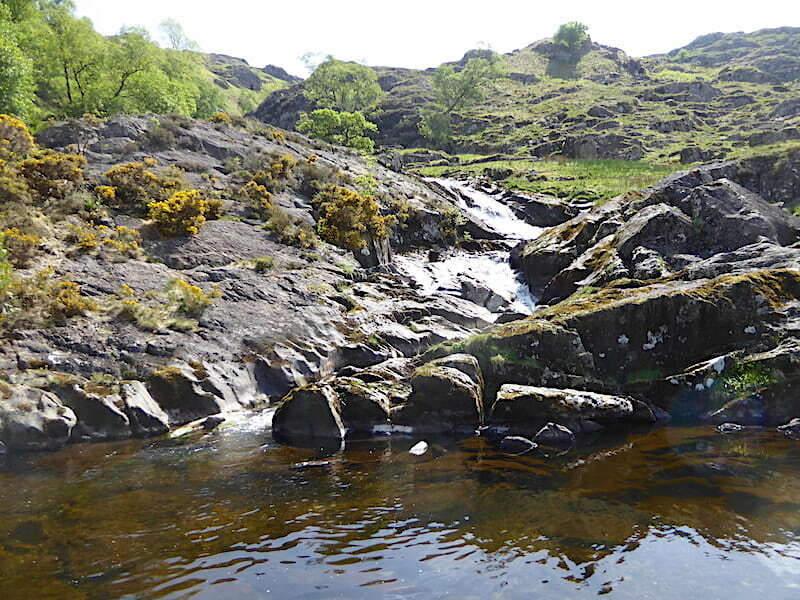 Looking back at the falls from the accessible grassy slopes down to the pool, a truly captivating sight. The pool viewed from above as we carry on up the slopes. Gradually the gradient flattens out although there are still more mini falls and slides along the way, though less spectacular now as the ground is much less steep. I made my way over the bedrock for a closer look at the previous view. The waters of Mosedale Beck now in calmer mood as we approach level ground …..
….. where one final fall and pool brings the delights of Forces Falls to an end, from this point …..
….. the beck assumes the characteristics of most other becks as it flows over and around a rocky stream bed having flowed from its source along Mosedale up yonder. 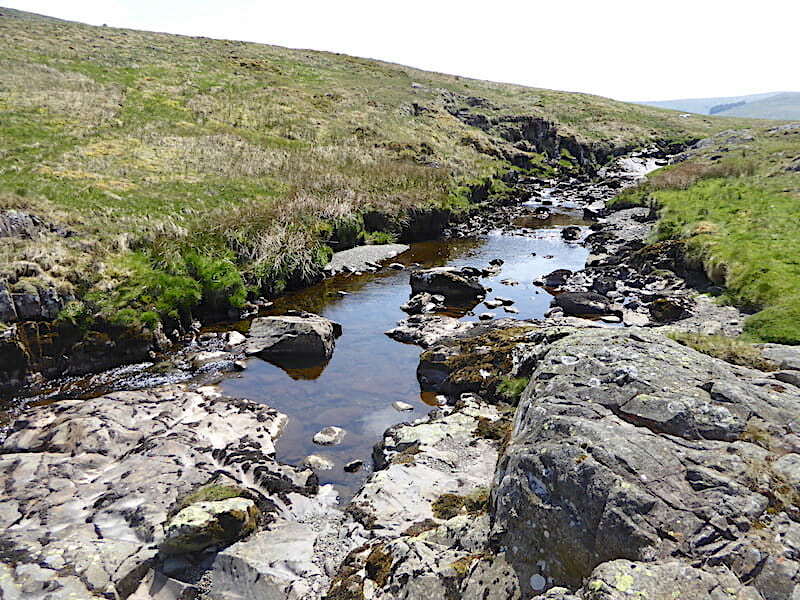 Rather than simply turn around and make our way back down by the same route we varied things a little by crossing Nabs Moor and making for the path coming in from Mosedale. 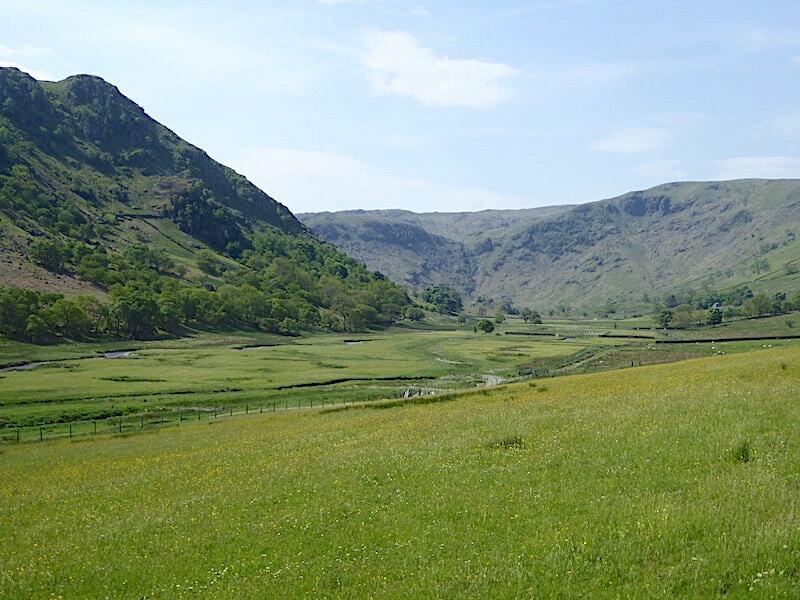 On the left are Nabs Crag, Geordie Greathead Crag behind which is Selside Pike and its crags. 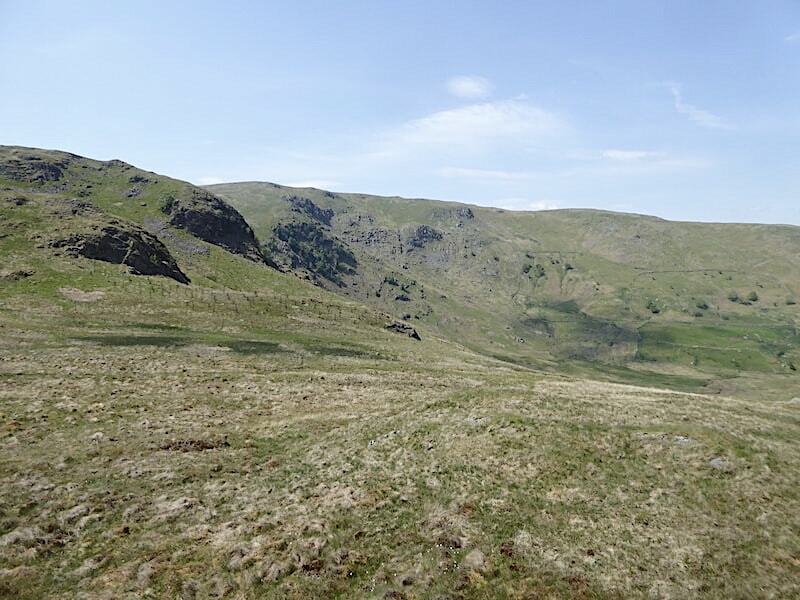 On the left, across Nabs Moor, is the rocky top of Howes, a subsidiary top of Branstree, with Selside Pike just in shot over on the right. 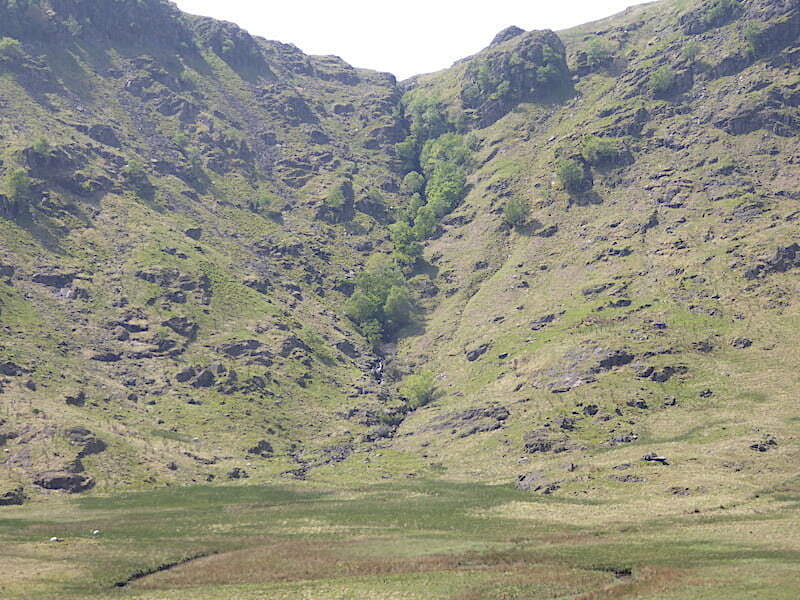 A closer look at Nabs Crag and Geordie Greathead Crag with Hobgrumble Gill flowing between them. 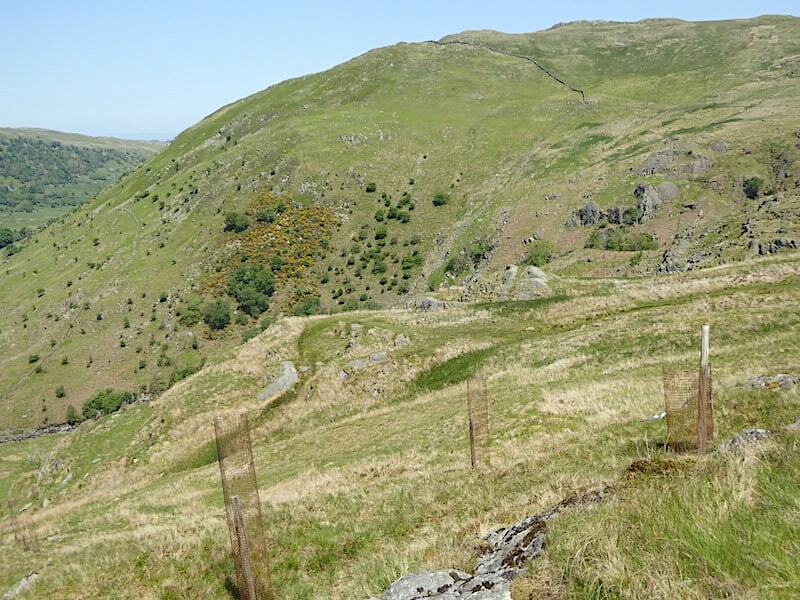 The foreground is littered with rusty fencing protecting what should by now have grown into strong young trees, well that was the plan presumably. As ever, very few have made it, maybe half a dozen have managed the herculean task of putting out a couple of leaves. The rest were non-existent leaving the rusty fencing protecting only a stout wooden pole. 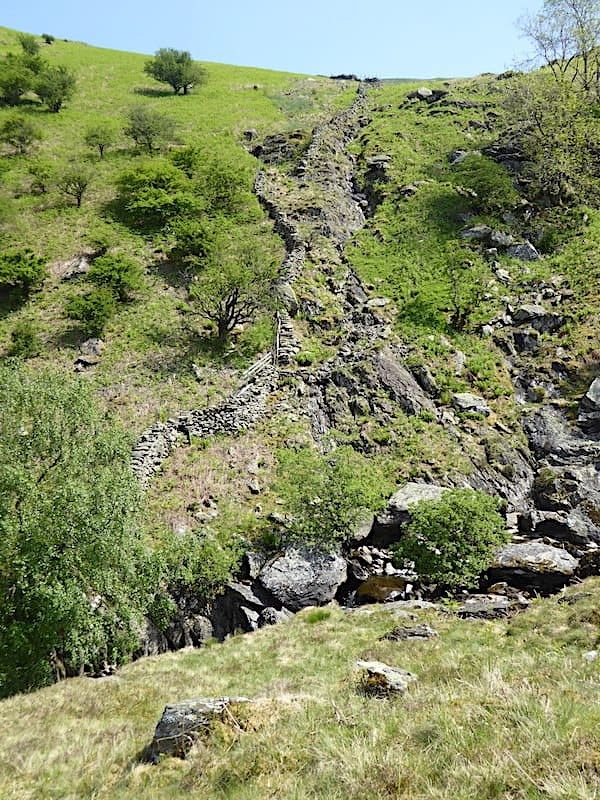 A closer look at Geordie Greathead Crag and the crags below Selside Pike across Hobgrumble Gill. 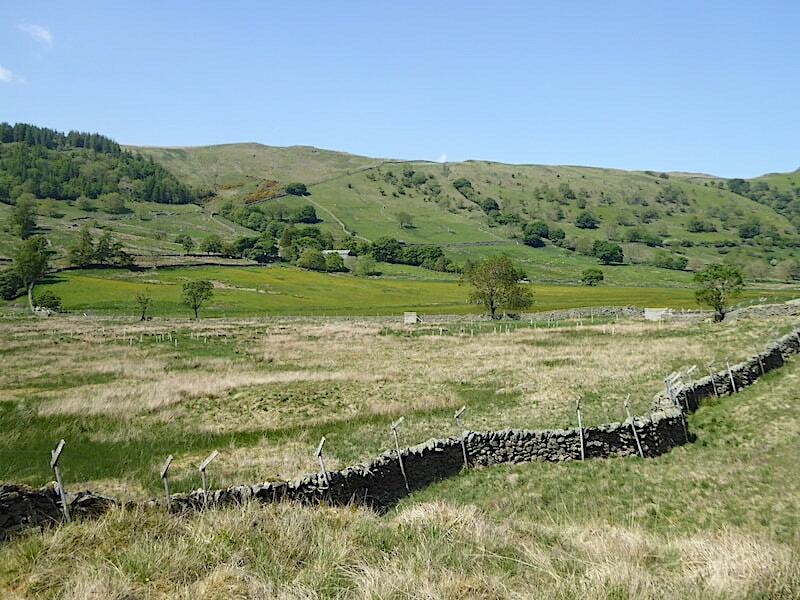 Looking in the opposite direction, beyond the wooden poles and their rusty fencing, to where the long and sturdy wall, mentioned earlier, rises up the fellside eventually bisecting Ewe Close, on the left, and Fewling Stones, on the right. 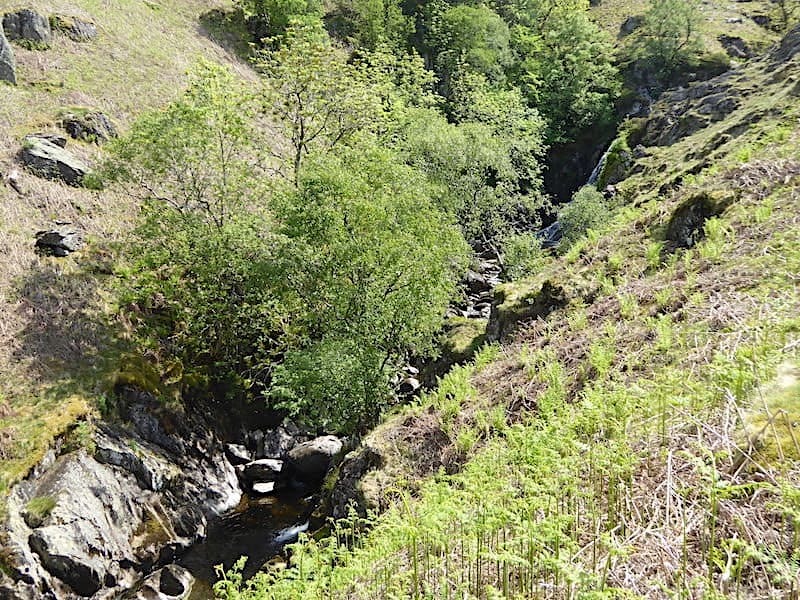 Between them and where I’m standing are the falls of Mosedale Beck. 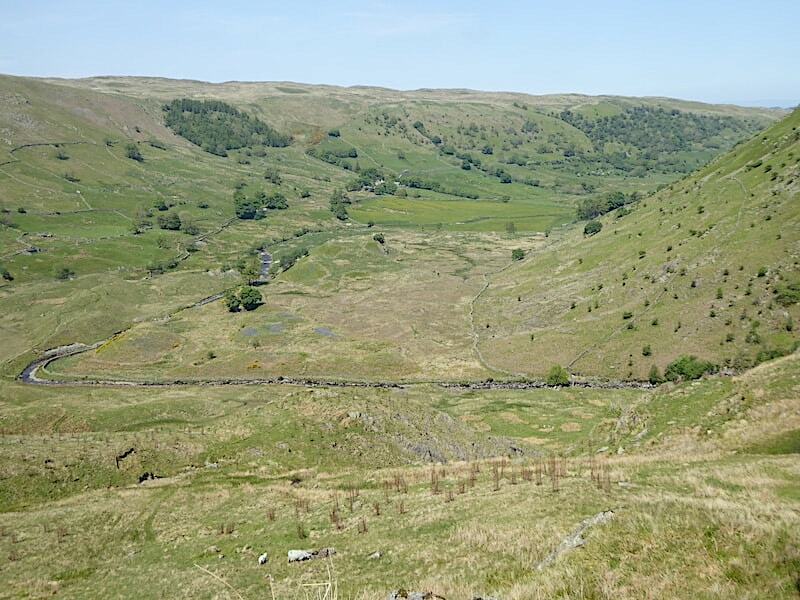 The view down into Swindale from Nabs Moor. 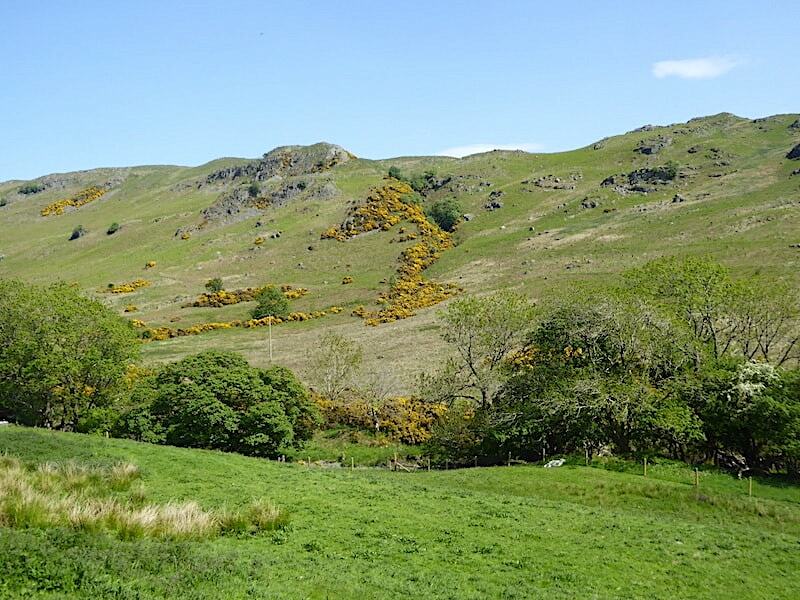 The narrow strip of glacial moraine is clearly visible on the left where the becks curves abruptly, Simon Stone, hidden by the trees, stands on a rise to the right of the beck curve, the buildings of Swindale Head Farm are tucked in amongst the trees above the yellowing hay meadows, and on the skyline is the eastern ridge of the Naddle Horseshoe. Towards the bottom right you might be able to pick out the green path of our return route. 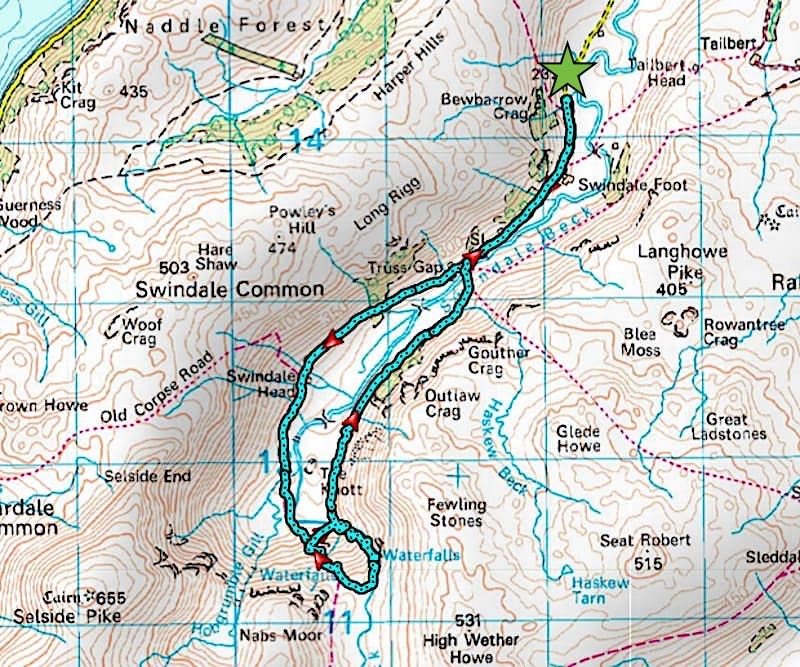 We’ll cross Swindale Beck, over a newly installed footbridge, and follow the path above the wall over the low slopes and back to Truss Gap. Looking across to Fewling Stones and High Wether Howe on the skyline as I make my way back to rejoin J who is standing on the Mosedale path patiently awaiting my return. Its very warm and its not windy so he’s happy enough to wait around for a few minutes while I have a look around. 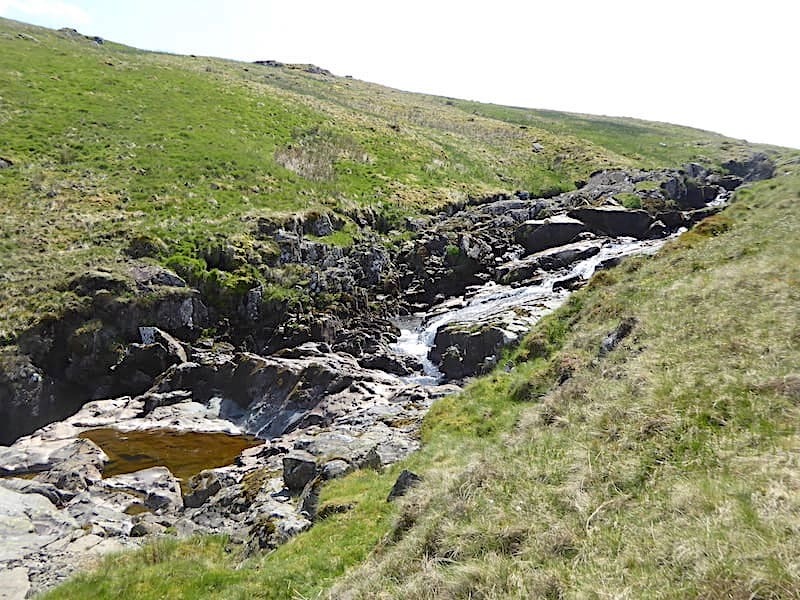 We re-join the grassy old bridleway and its hair-pin bends but we leave it a little lower down and make our way back over to the foot of the falls once again. Back at the first pool and a view of the bridge we will be crossing in a little while. First we have some unfinished business, the little matter of the foot cooling treatment we promised ourselves when we were here earlier. Plenty of rocks to sit on while you dangle your feet in the cool water so that’s what we did. 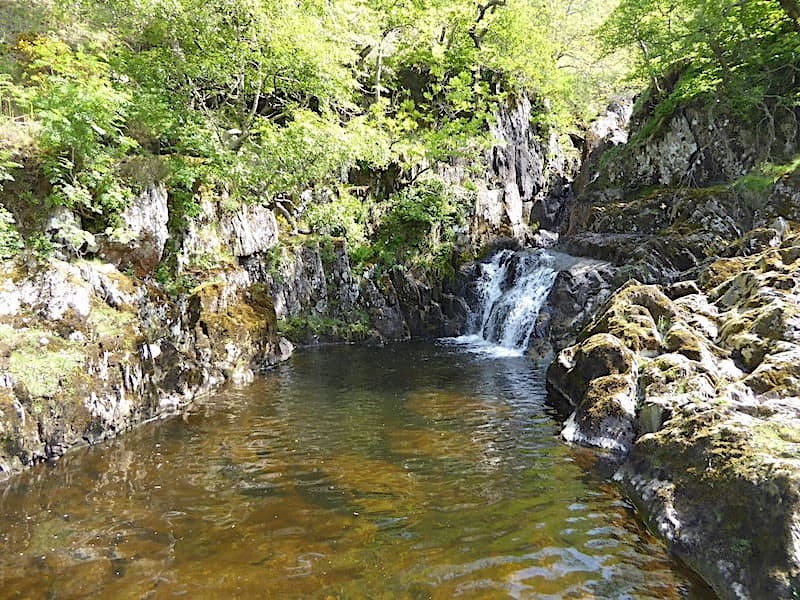 I think it would have been a little too cold at present for a full blown dip and we didn’t have swimming gear with us, and we passed on wading too as the stones on the bottom of the pool looked very slippery, A foot dangle was just as effective. Above us, at the next pool, we could see that some people were leaving, not the ones who had been there when we first arrived either, they were no longer around, so we grabbed boots and socks and had a quick scramble up to it. A group of people may have left but another three had just arrived and were obviously getting ready for a dip when we turned up. It seemed as though we were fated to interrupt people’s bathing plans today. Nevertheless we found a little spot for ourselves and enjoyed a little more foot splashing. The lady of the group, swimsuit already donned, told us she had last been here forty years ago and had always remembered it. Now she was back with her husband and grown up son, at least I think that’s what they were, to enjoy it once again. As we were chatting and paddling we mentioned that there were more, and larger, pools a little further up. The lady didn’t know about them and the two men were interested enough in visiting them to ask how to reach them. Once we’d given them the details of where to go off they went. By which time another lady, also swimsuit clad but with towel wrapped around for modesty’s sake, came down from the crags above and joined us. She was waiting for her husband and daughter who had decided to walk up to the top of the falls, as we did. She had decided not to go that far and came back down to await their return. 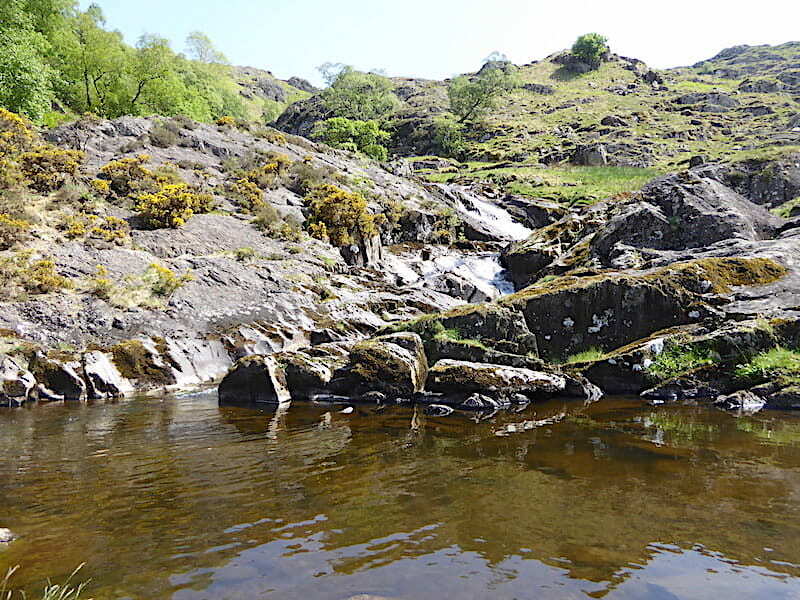 As we were chatting a young man and his dog turned up, and below us, at the lower pool, a large family group had arrived, mums, dads, kids, dogs, picnic baskets etc. They were obviously there for the rest of the afternoon. 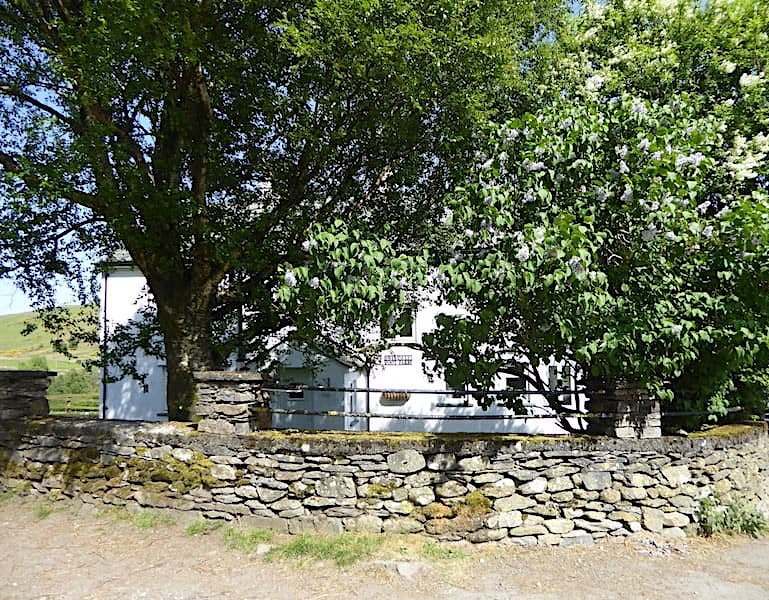 A normally quiet and infrequently visited valley on the fringes of the Lake District was suddenly more akin to a busy beach resort. Its the first time we have ever encountered more than a couple of walkers around here. 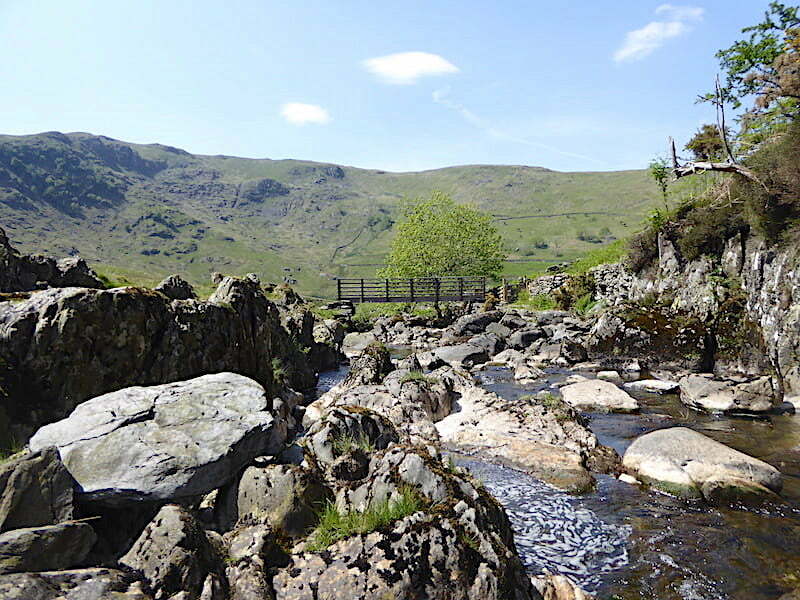 We leave the paddlers, bathers and picnickers to their respective pursuits, go back down and cross the bridge to follow the return path back along Swindale with the scent of bluebells drifting across from a large patch of them growing around the outcrop over on the left. 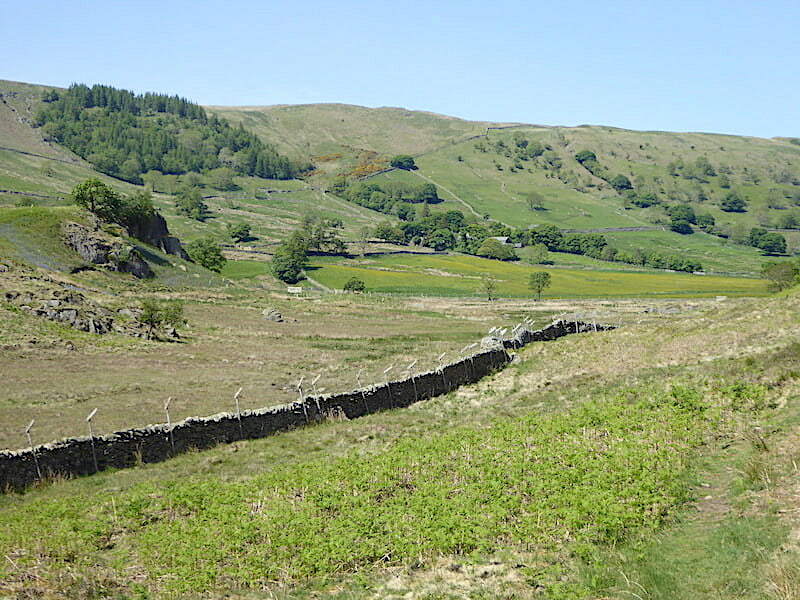 This is a grand little path, grassy and gently undulating for most of the way, from which we have a view of the western side of the valley which we walked along earlier. The buildings of Swindale Head Farm are back in view beyond the buttercup meadow. 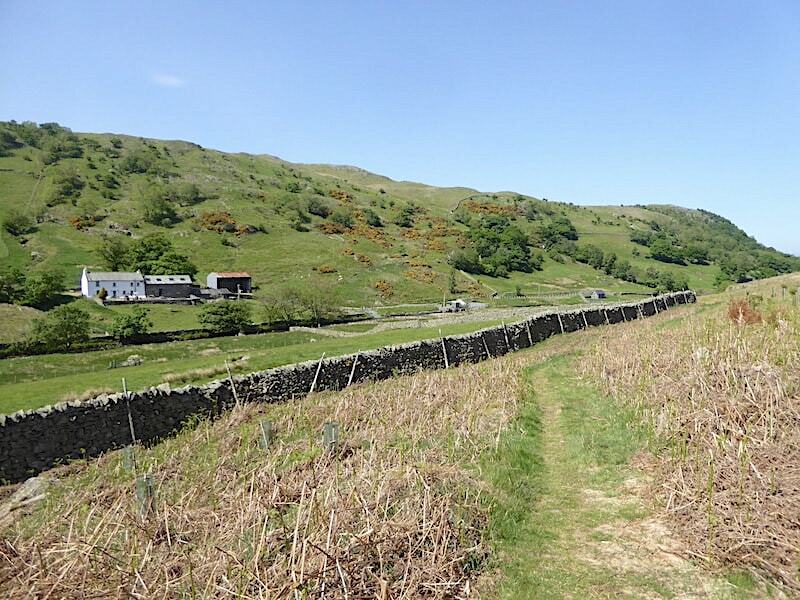 A high fence has been installed along the wall to prevent the deer getting at the wild flowers in the meadow. 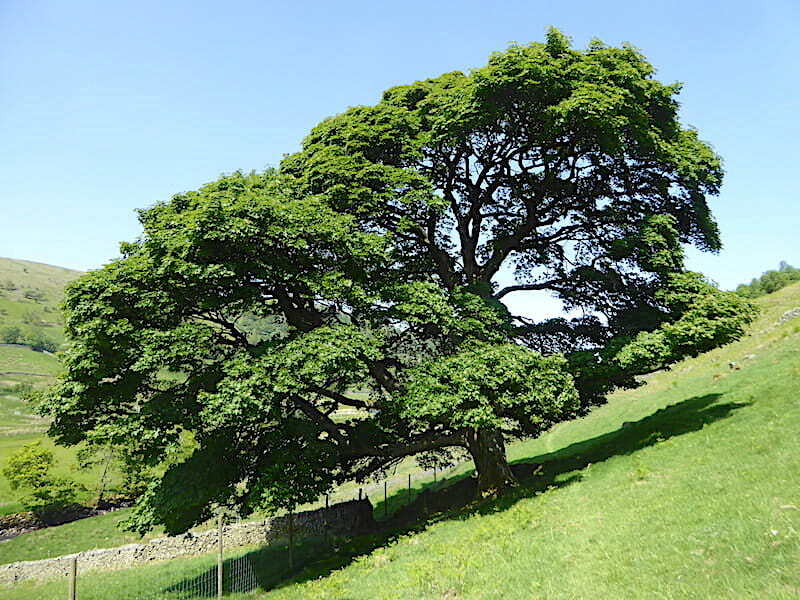 A superb sycamore beside the easy path. 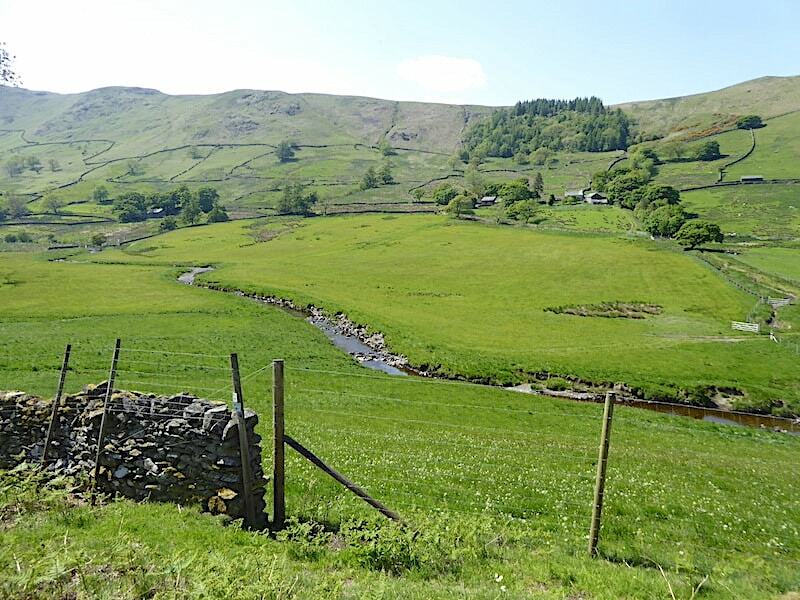 Below us Swindale Beck meanders through the meadows below Swindale Head Farm with the ridge leading to Selside Pike on the left skyline. 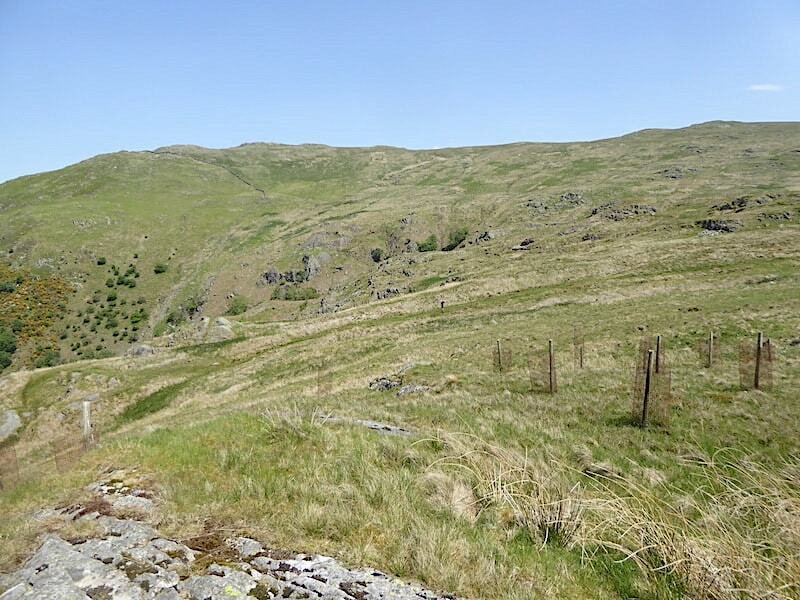 There’s only one short uphill section leading up to a gate, beyond it the path returns to level walking once again. Another footbridge, this one across Dry Grove Gill if I remember correctly. 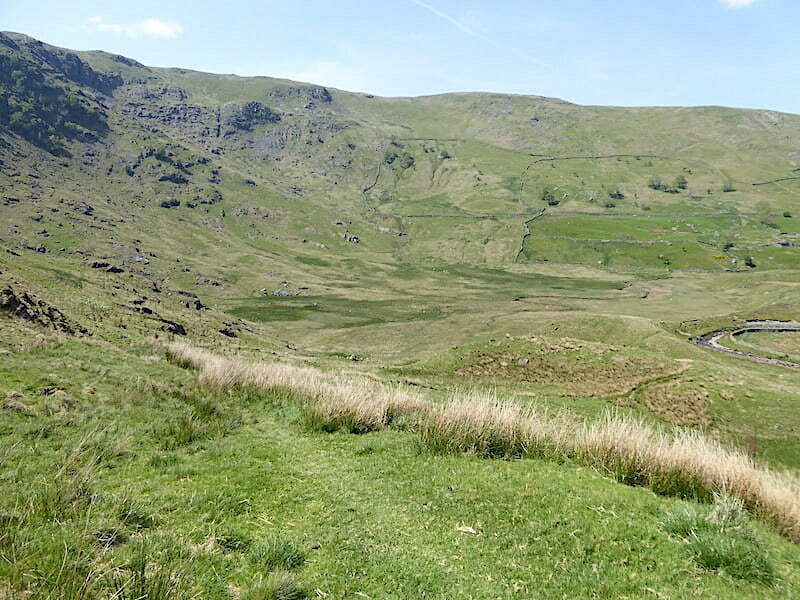 The green hill beyond is Bewbarrow Crag below which is the car parking area. The path heads back to the beck crossing at Truss Gap. Behind us the two young lads are still hard at work scaling Gouther Crag which we thought they would have completed by this time. We’ve been out about four hours and we haven’t been rushing at all, its been a very leisurely walk, so we were surprised to see them still up there. 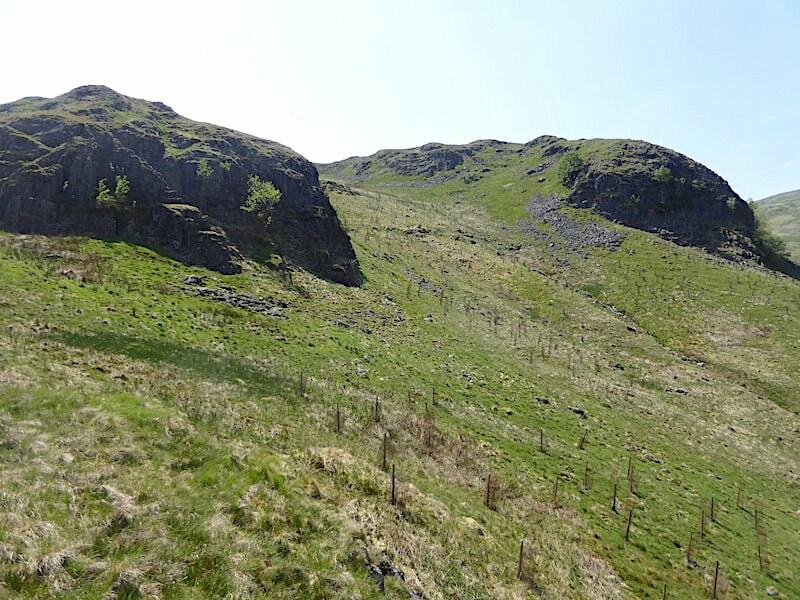 Perhaps they scaled Outlaw Crag first, or maybe Gouther Crag is a difficult climb and needs scaling carefully. 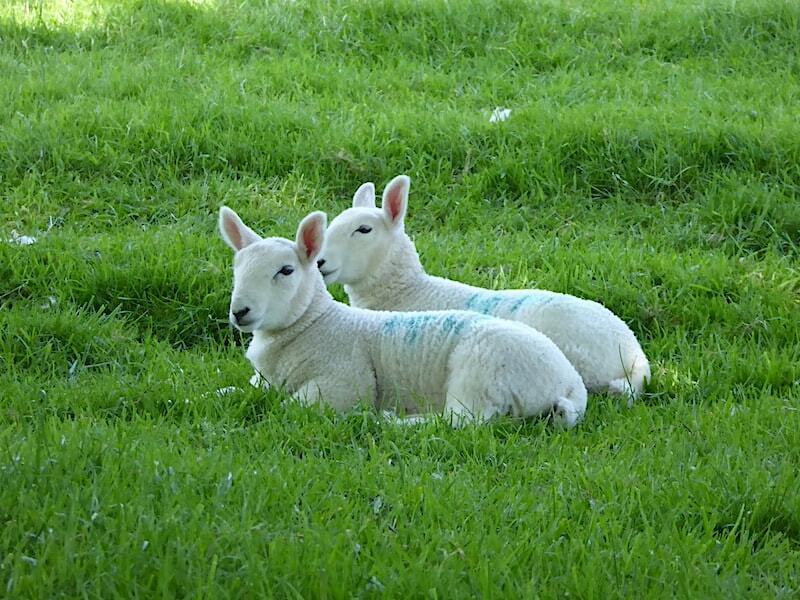 No matter, they are out in the sunshine doing what they enjoy and that’s the most important thing of all. Back to the stepping stones across the Beck at Truss Gap. We didn’t use them as I wanted to take a shot looking along the beck. Standing on them and looking upstream would have meant shooting straight into the sunlight, looking downstream would have included the water intake facility which was ugly. Nothing for it then but to use the crossing at the intake facility and take a shot from there. Looking downstream from the intake crossing with some of the metal structures still visible in the distance, though they are far enough away to be much of a nuisance. Once over the crossing we are back on the lane on the west side of the valley with a view of Langhowe Pike opposite us. 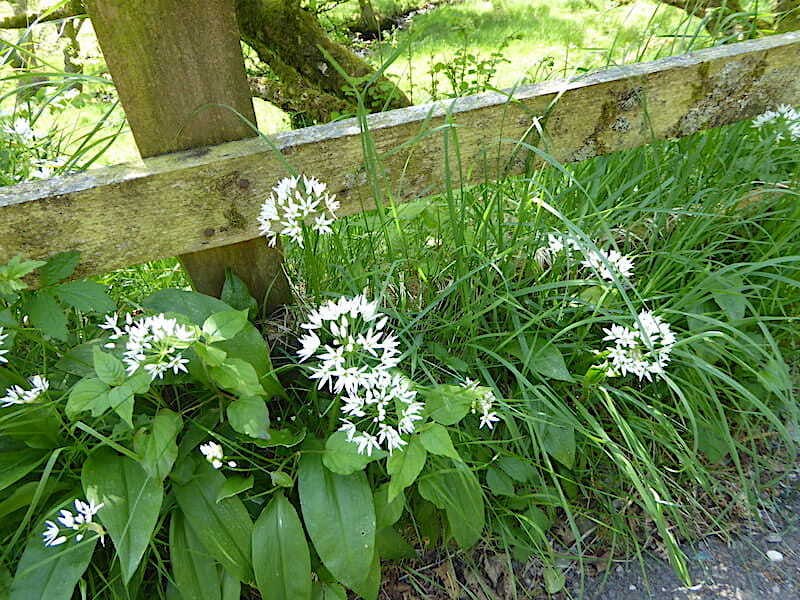 We are also on the lookout for wild garlic so we can pick some leaves and get them home before they wilt. Did we get any? Absolutely not. Not a wild garlic plant was to be seen anywhere along the lane north of Truss Gap so we came home empty handed, fine foragers we are then. Back at Swindale Foot Farm which looked wonderfully cool in its circle of trees, and then just a short stroll back to …..
….. the very crowded parking area. We counted twenty cars altogether which, in the grand scheme of things, is a paltry amount. Put them in Morrisons car park in Penrith and the store would be wondering why it had so few customers. For Swindale it practically amounts to gridlock. We were astonished because we have never seen so many cars parked here before. Swindale is often described as being an unfrequented valley that time forgot, well it was neither of those things today, far from it. I am not of any particular political persuasion by any means but below is a link to an article written in 2014 by the MP for Penrith and The Borders in which a few of the observations noted in the article seemed to chime, in some respects, with my own thoughts. I thought it might be of some interest to anyone else who is interested in the future of the Lake District.